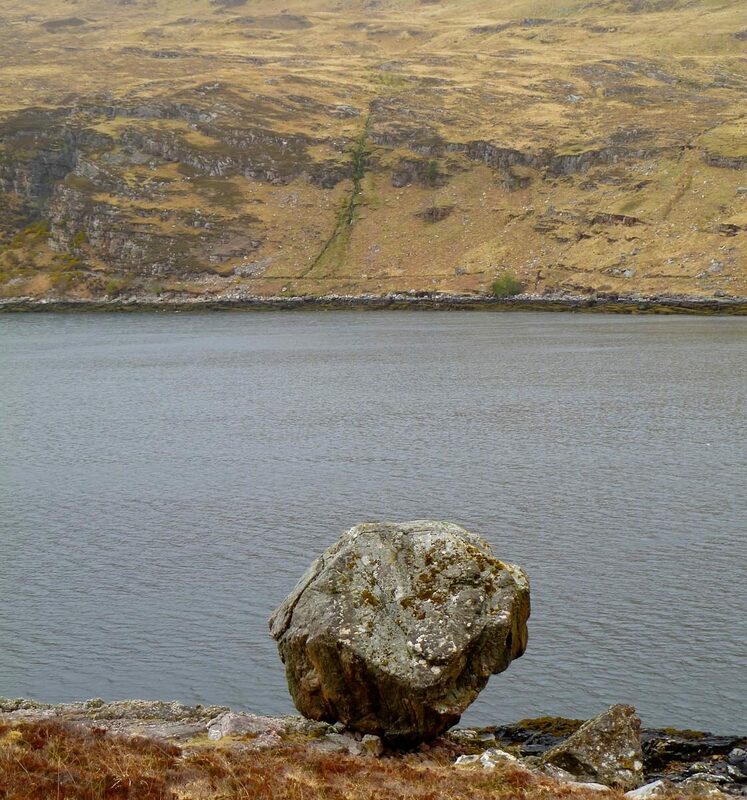 A number of years ago Amy bought David Paterson’s well done photo book The Cape Wrath Trail and the images and description were quite intriguing. 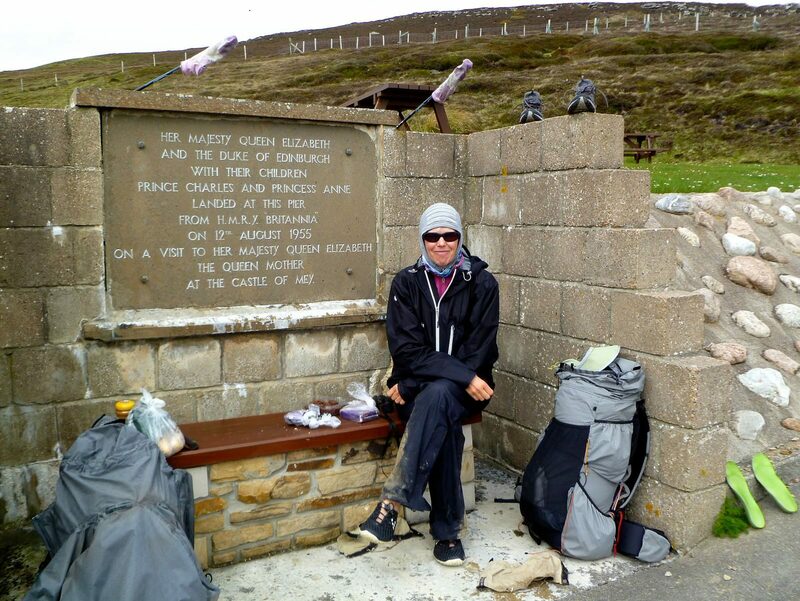 We had also taken many hikes in England and Wales and frequently met other hikers who spoke very highly of Scotland. Putting those two things together led us to design a trip around walking the CWT. 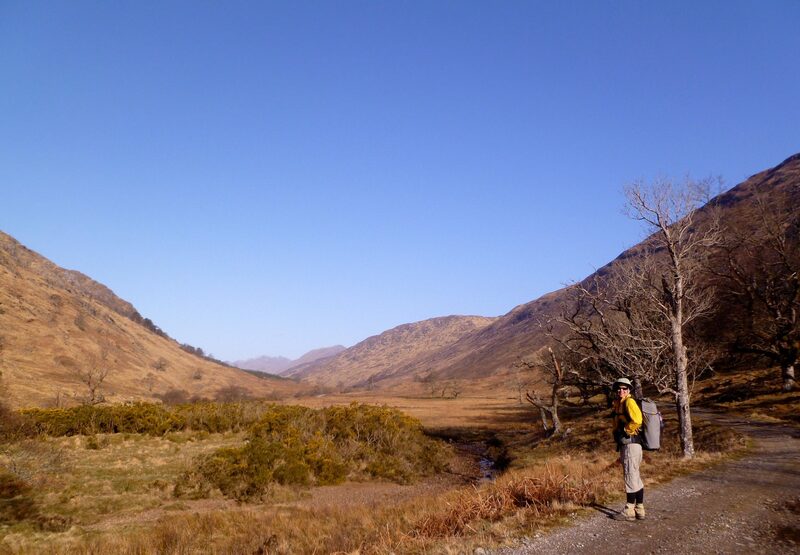 Adding the West Highland Way was an easy decision as we had already walked several British National Trails and enjoyed the experiences. James spent a lot of time studying the maps and realized we could add a fine piece of coastal walking along the top end of Scotland. A few tweaks here and there and we had a route. iPhone with the ViewRanger app loaded with OS maps, and the Gaia GPS app loaded with satellite imagery. In 2013 ViewRanger was not a reasonable way to view satellite imagery, but maybe it is now. Gaia GPS does not provide access to OS maps, which are essential. We created paper maps by loading our gpx data into WalkHighlands’ mapping tool, taking screen images, and assembling those images using Adobe Illustrator. It would be easier but quite expensive to purchase the OS maps themselves. 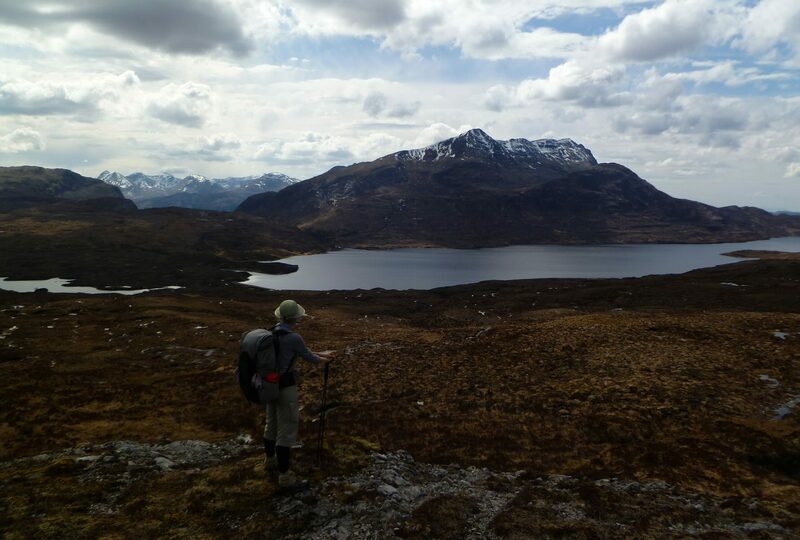 WalkHighlands has excellent information, forums, gpx data, and mapping tools for all of Scotland. Cicerone Press North to the Cape, by Phil Hinchcliffe. 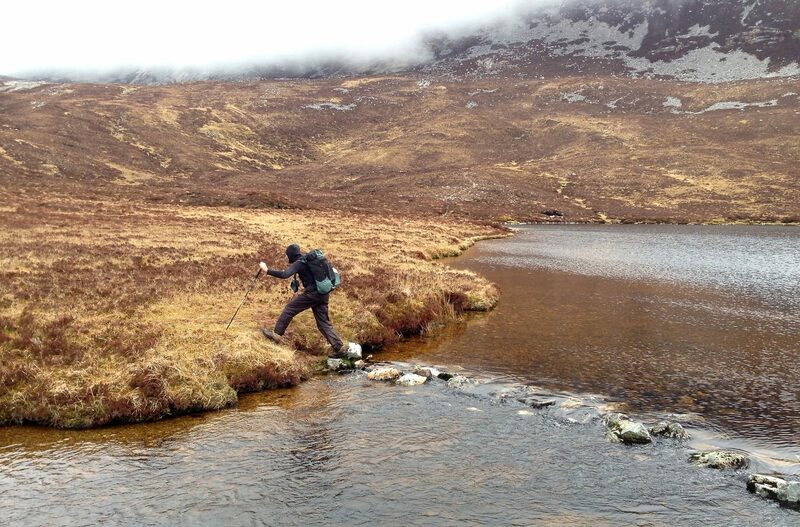 Cicerone Press Walking the Cape Wrath Trail, by Iain Harper. 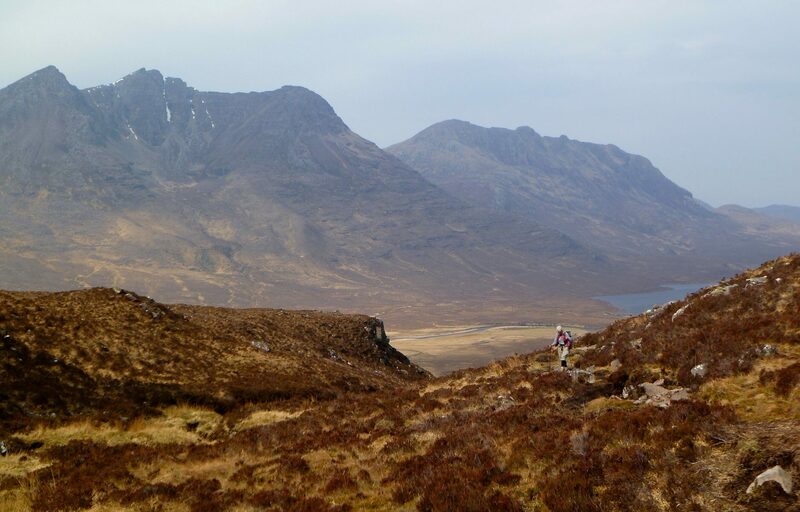 The associated CapeWrathTrailGuide website has gpx data and other useful information. Cicerone Press The West Highland Way and its companion Map Booklet, by Terry Marsh. The walkway first takes you through the city streets into a network of riverside greenways. 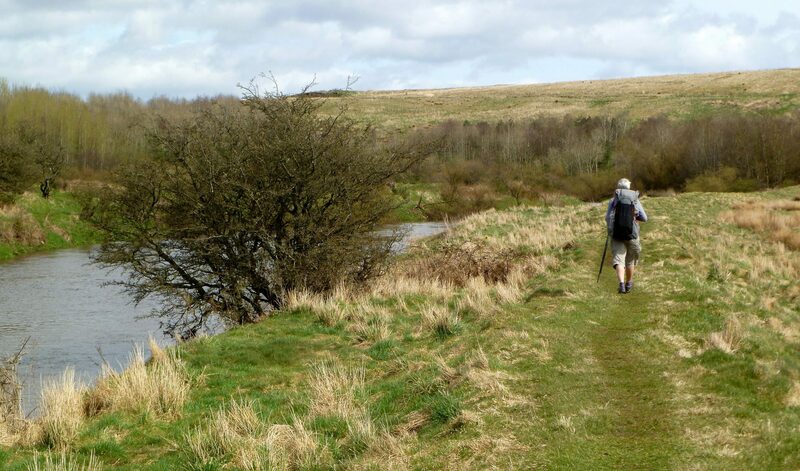 The KRW follows the Kelvin River out of the city and north to the town of Milngavie where we would start our main route. A good portion of the KRW is in the countryside. By following this route, we didn’t have to take motorized transport to the start of our walk. 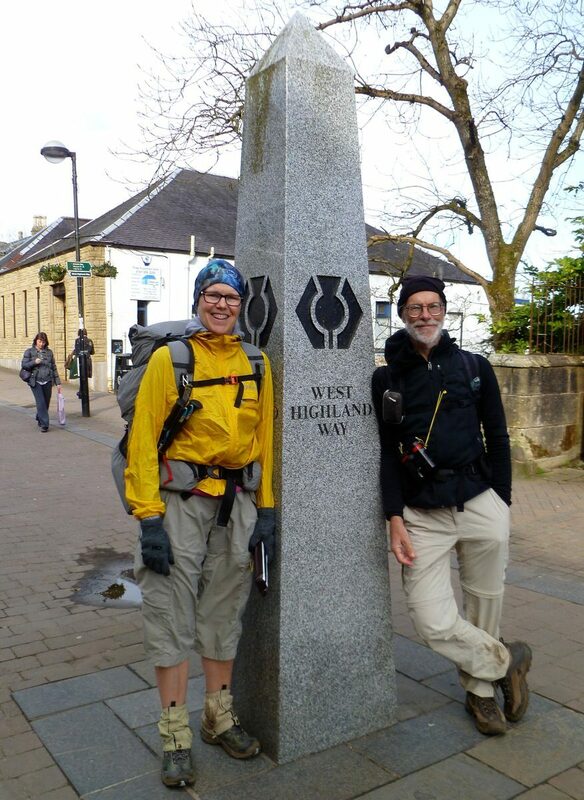 In Milngavie (pronunced Moogy), at the start of the West Highland Way, a 90+ mile walk north into the Scottish Highlands. We shopped for provisions and had dinner in town before we started the WHW at around 6 PM. 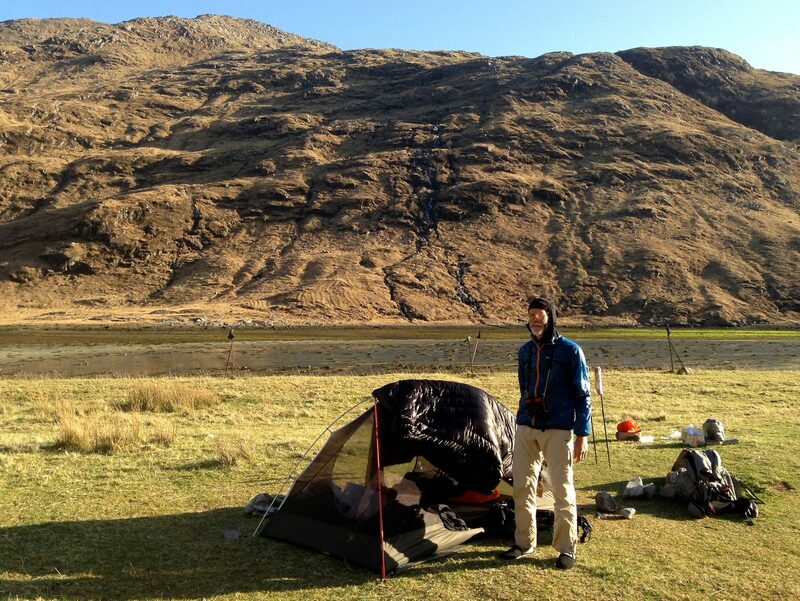 Camp #1, April 24. 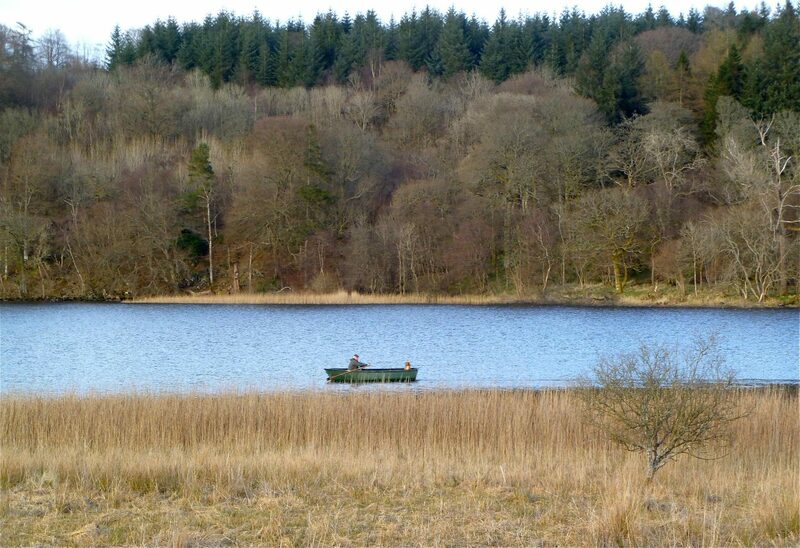 Loch Wood a few miles north of Milngavie. 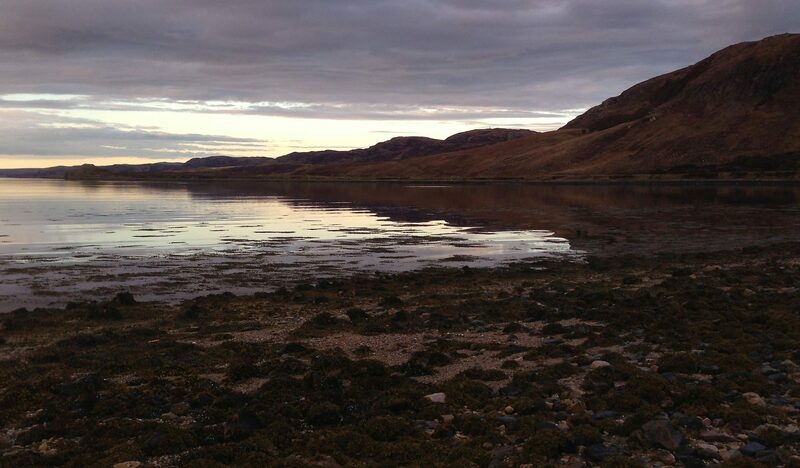 We camped on the loch shore here. Dryman, the first town north of Milngavie. We had luch in the Dryman Pottery, a pub. The next morning as we prepared to leave camp, we had a nice rainbow. 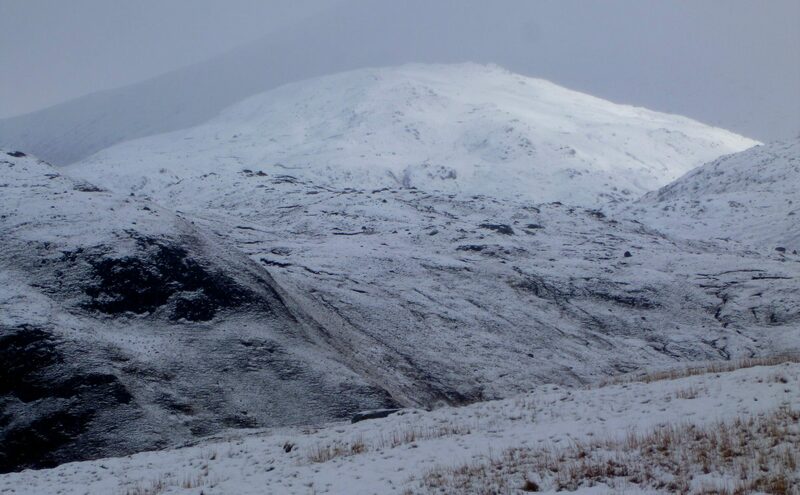 The higher peaks still had a lot of snow, often extending down to relatively low altitudes. The Green Welly in Tyndrum, where we had a really good pizza lunch. It is a popular stop for weekend motorcyclists. 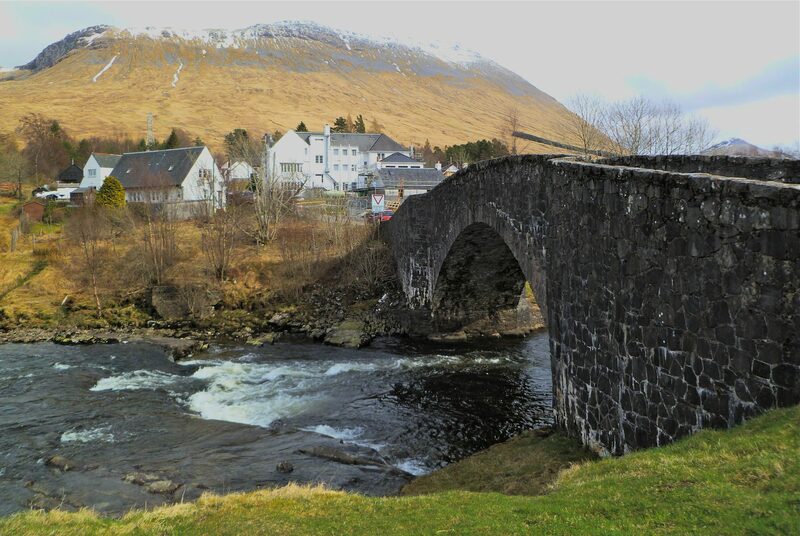 The Bridge of Orchy. Built in 1751 by the British government for miitary purposes. At times, it was damp, dank, and dreary. 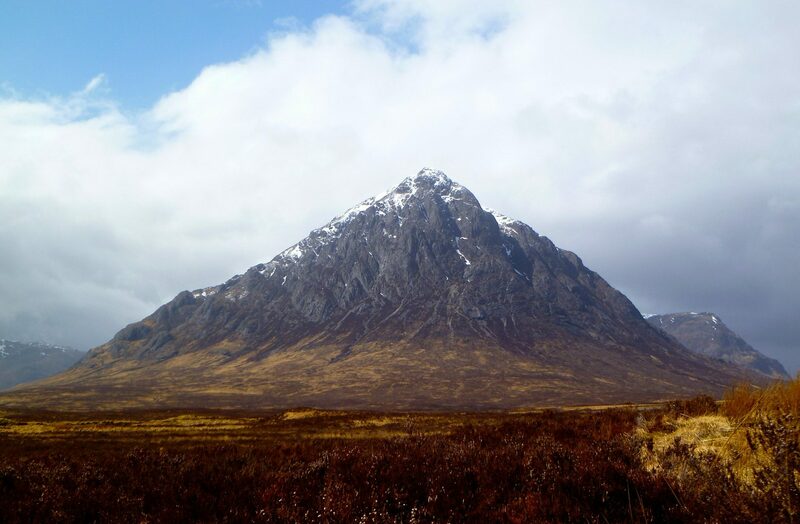 Stob Dearg (1022 meters) in Glen Coe. Ft. William from across the Loch. Inverscaddle Bay from Camp #6. There had been intermittent rain all afternoon, but it stopped soon after we set up the tent and we had a fine evening. The first clear morning of the trip as we headed up into Cona Glen following the course oi the Cona River. By noon on day #7, the sun had dissappeared and we had some drizzle crossing the pass below Sgorr Craobh a’ Chaorainn (we couldn’t pronounce it either). 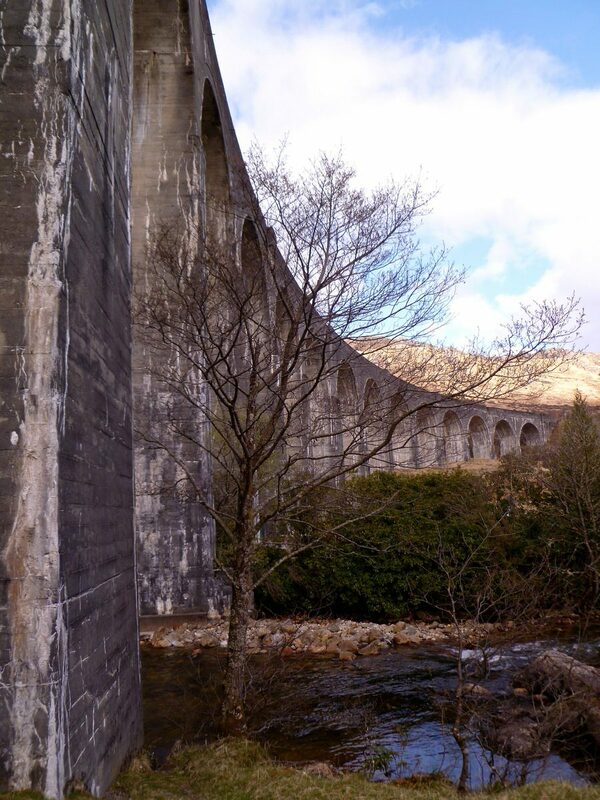 The Glenfinnan Viaduct, which starred in several Harry Potter movies. 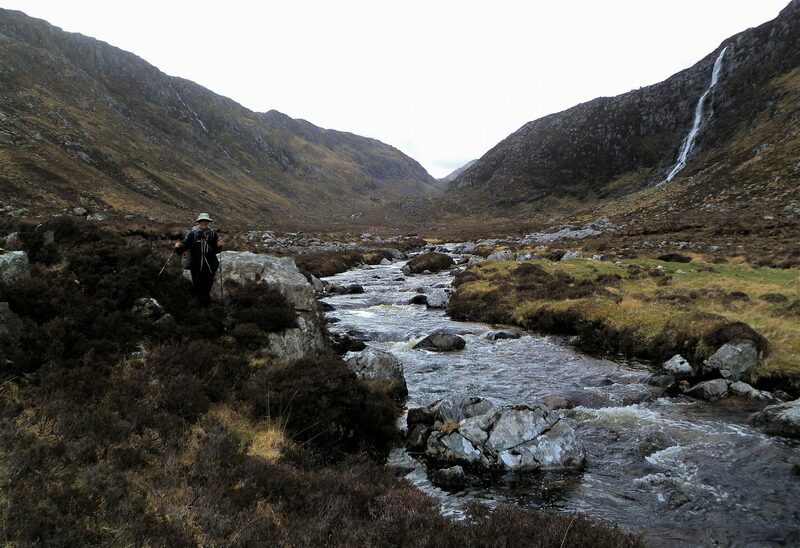 The Finiskaig River, which we had to wade as there are no bridges. 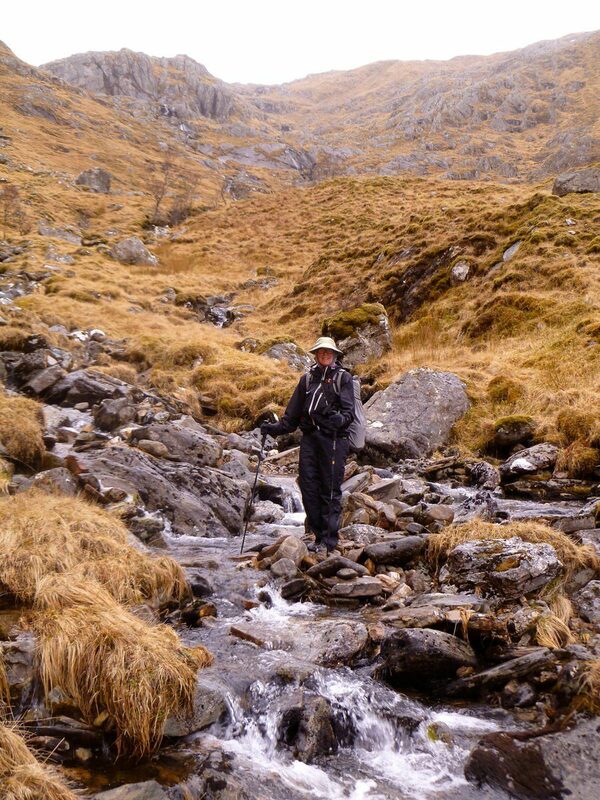 And lots of streams to rock-hop or wade across. We had long ago given up trying to keep our feet dry. A view from the front door at the B&B. Cascades everywhere we looked. 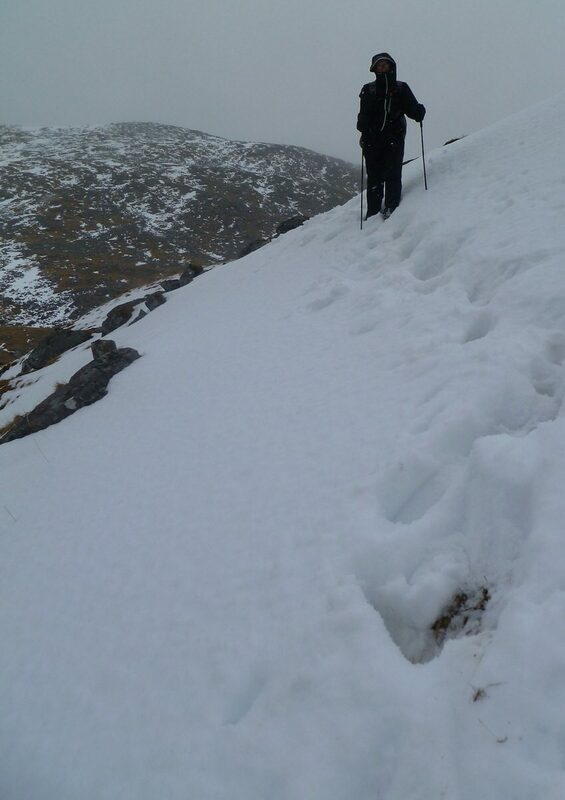 Crossing the Bealach Coire Mhalagain, at around 700 meters. We had partially clear beautiful skies the next morning, but within an hour the clouds closed in and it stayed 100% cloudy for the rest of the day. 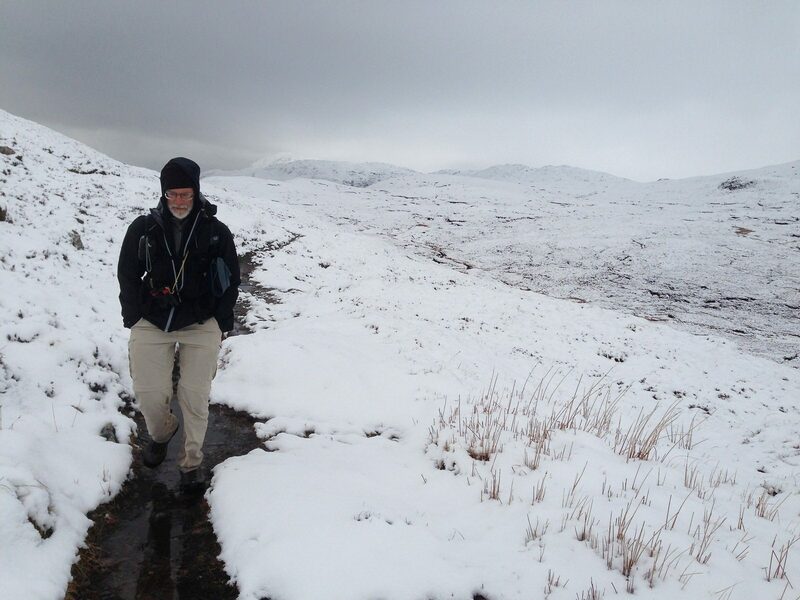 Crossing the bealach na Sroine; it was actively snowing off and on. 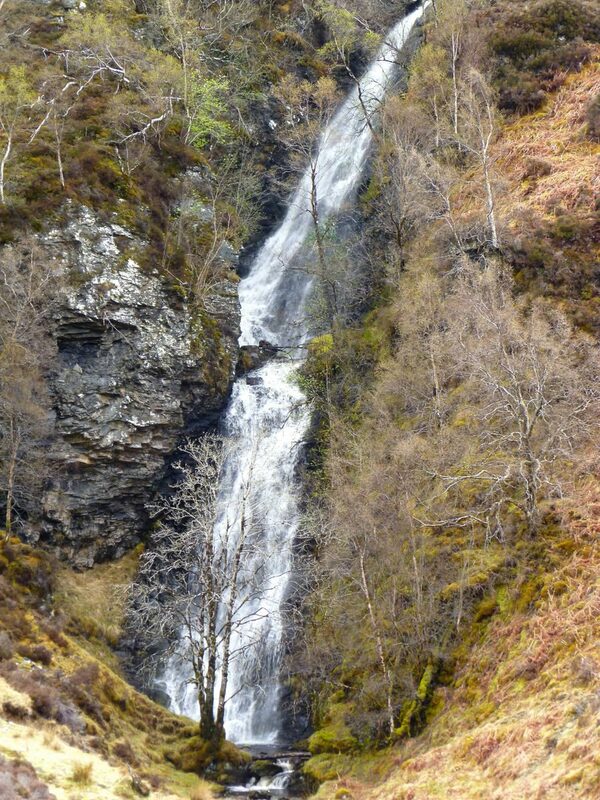 The Falls of Glomach, that at 113 meters drop, are the 3rd tallest falls in Britain. The landscape was spectacular. 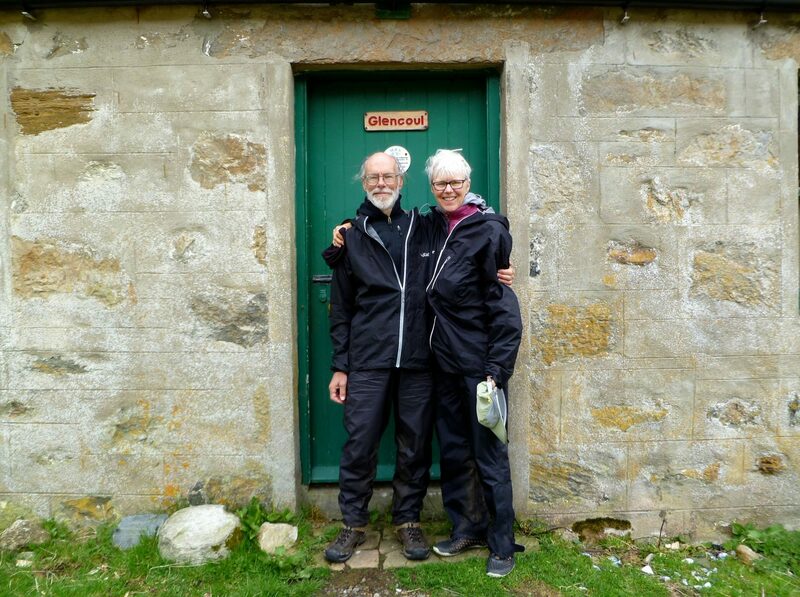 Late in the afternoon, we reached Bothy Maol-bhuide, which was a very welcome sight. The wind was howling, rain was falling and there hadn’t been a reasonable place to set up a tent for the last several hours. Leaving the bothy in the morning of day #12, well rested and ready to face the weather again. Camp #11, May 4. 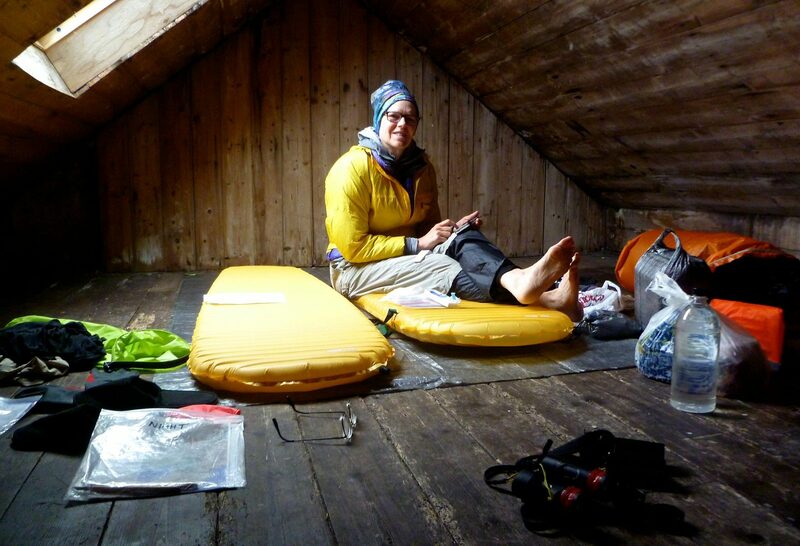 The cozy dry sleeping loft in the Bothy Maol-bhuide. 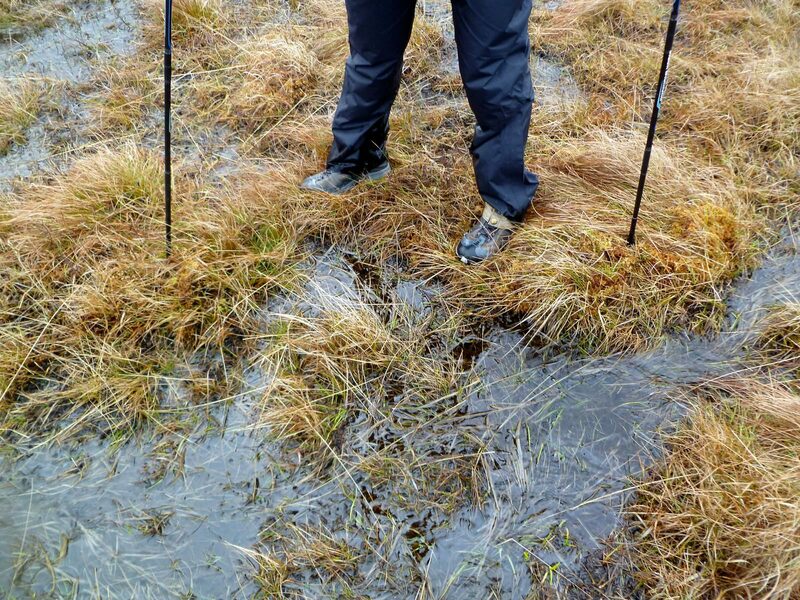 This is typical terrain when walking across the moors when it has been raining. 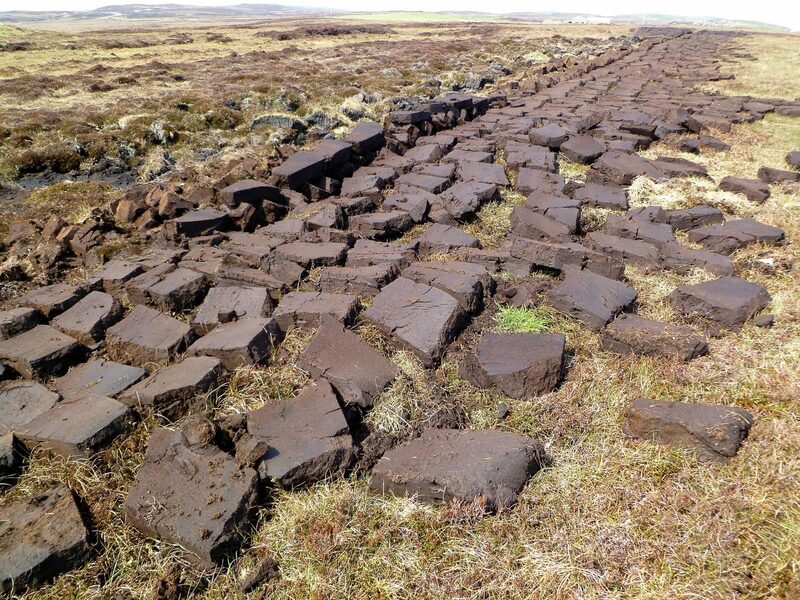 This is one of the reasons that it’s tough to find a campsite; the other reason is that the peat soil and grass/heather ground cover creates lumps with 30-50 cm lumps and pits everywhere. By late morning, the weather suddenly cleared and we reached the bothy at Bendronaig Lodge, where we ate lunch and dried out a bit. 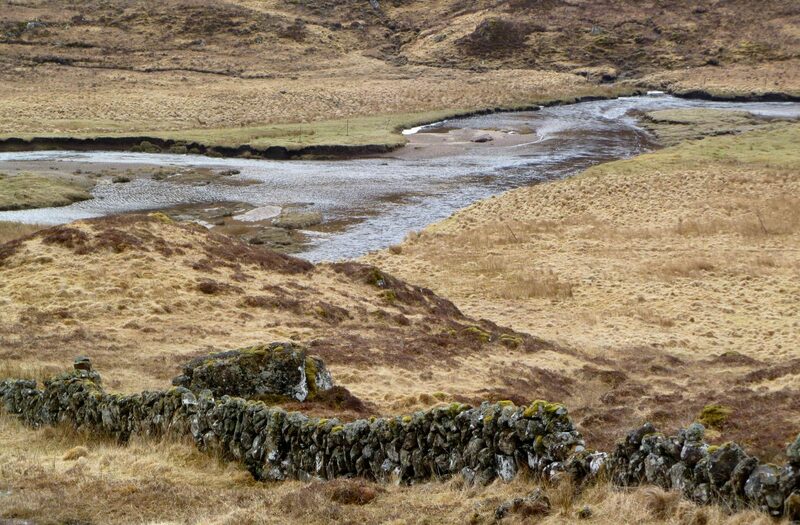 The Carron had overflowed its banks that night, and this small side stream was also flooded. 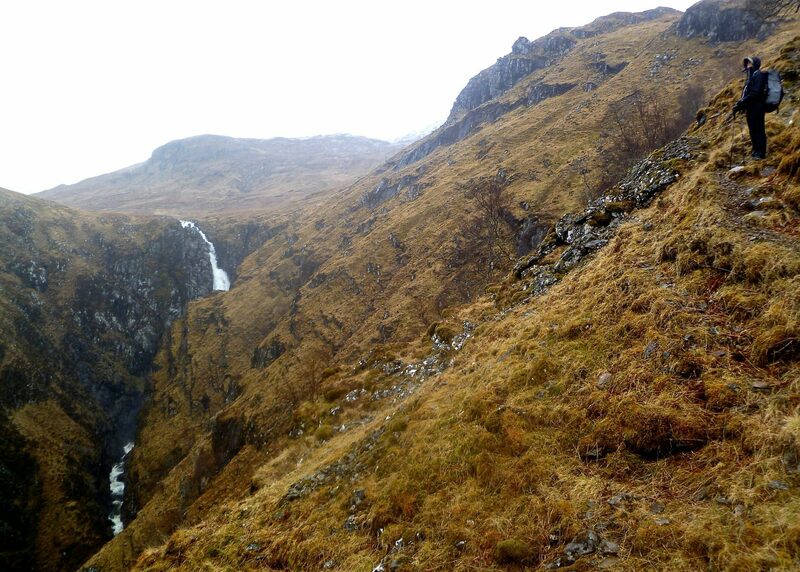 The long drop down into Glen Torridon. 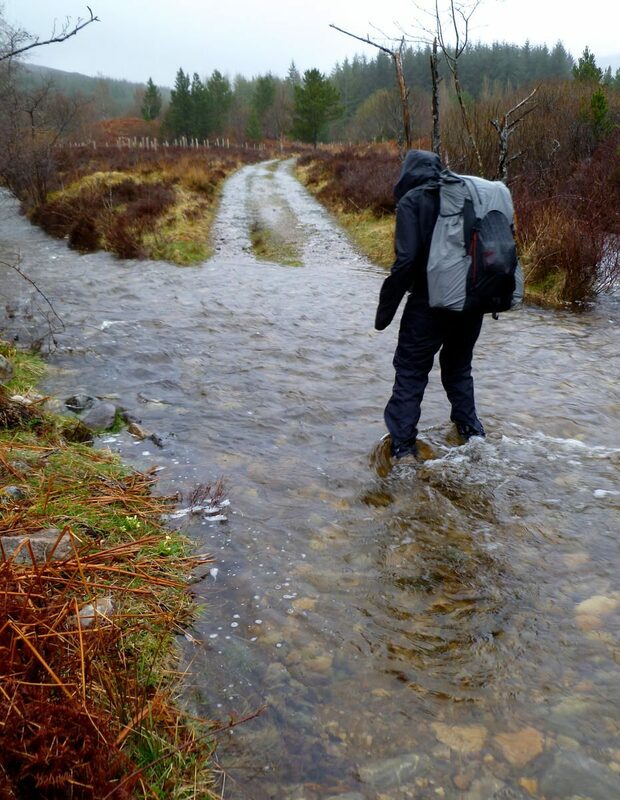 With streams overflowing their banks all around us, we elected to take the low level alternate into Kinlochewe. 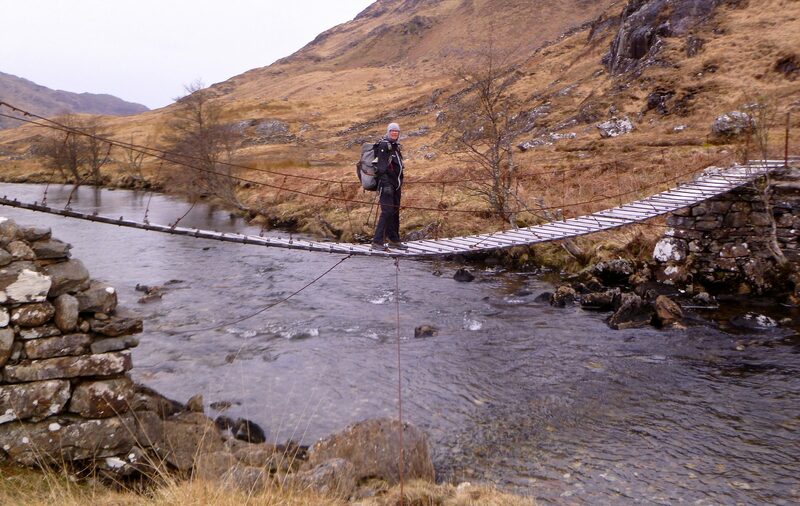 The guidebook auther warned that the route around the backside of Beinn Eighe was dangerous during high water. This choice did give us a chance to get a very tasty hot meal at the friendly Whistle Stop Cafe. 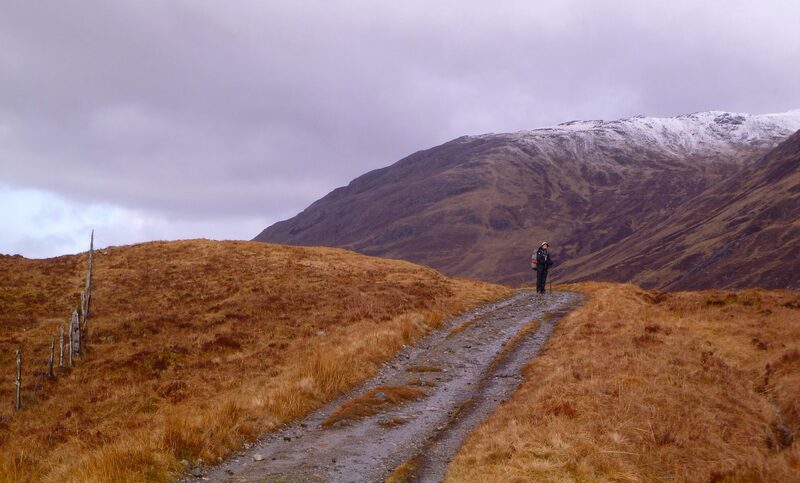 Walking up peaceful glen toward the Heights of Kinlochewe. 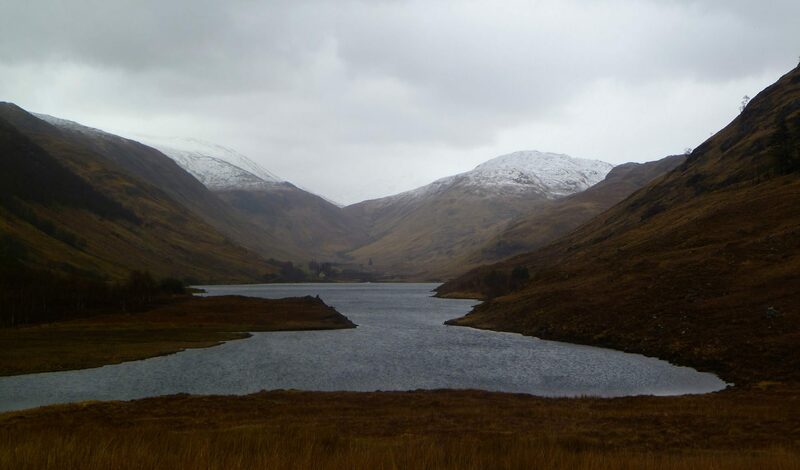 Looking down on Lochan Fada. Camp #14, May 7. 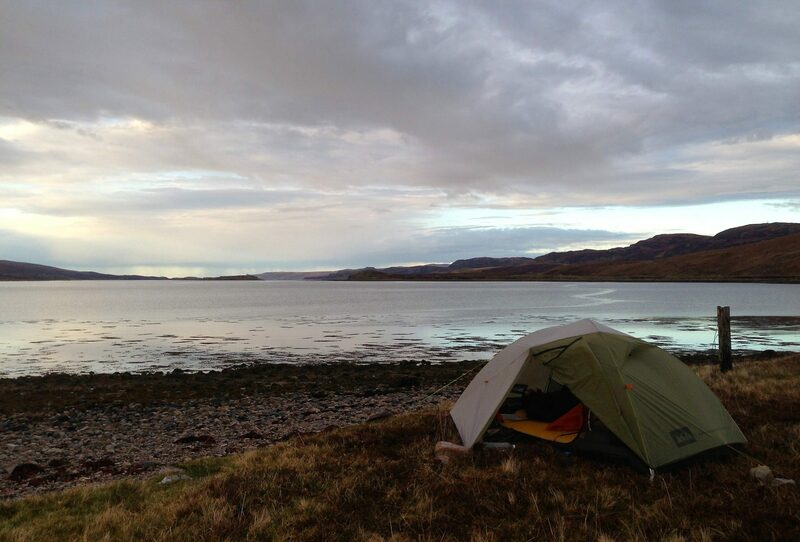 We found a 5 star campsite at the south end of Loch an Nid, where we saw our life Arctic Loon. One day hiker passed just as we arrived, otherwise we had the place to ourselves. The next morning was calm and sunny and proved to be the nicest day on the trip to date. 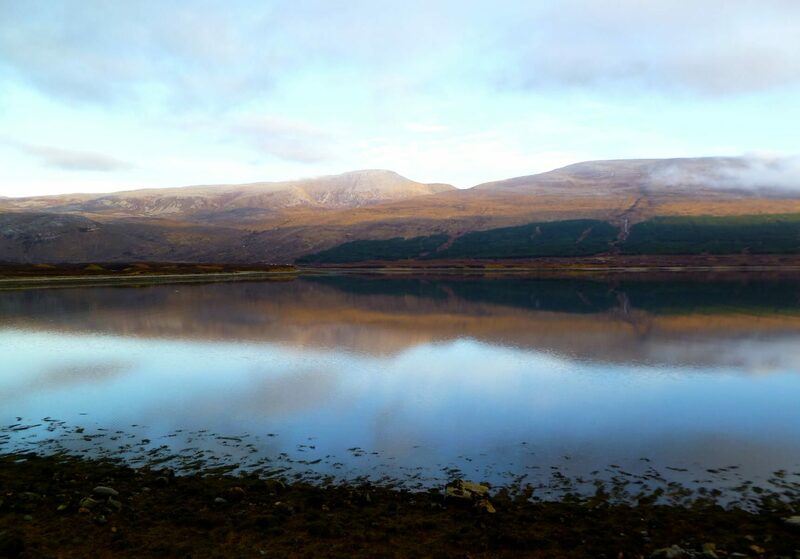 We walked up the road along the edge of the loch to Ullapool, a sizeable town where we could re-supply. 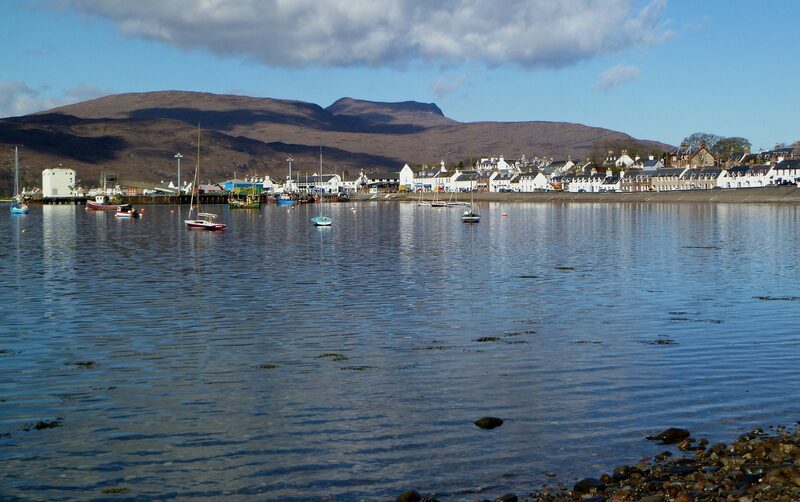 Ullapool was a nice town with lots of places to eat and a large modern supermarket. 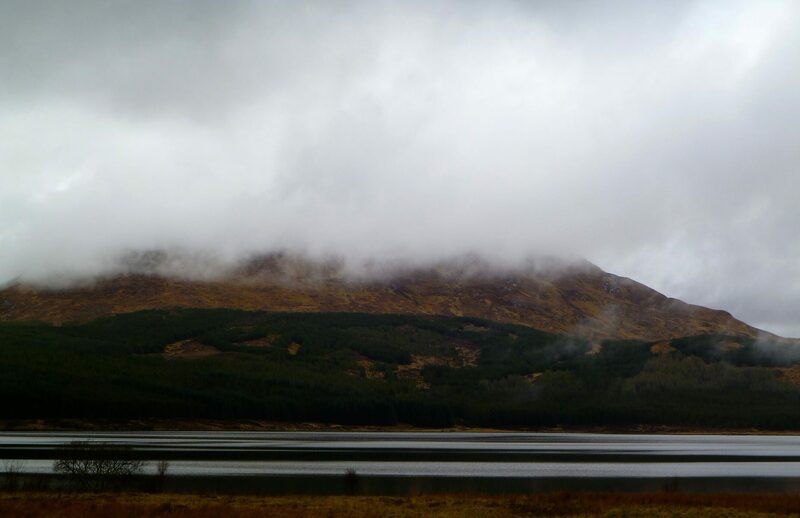 Looking west toward Ullapool, where the clouds have returned. Our decision to press on was the right one. A beautiful campsite with a very nice sense of space. 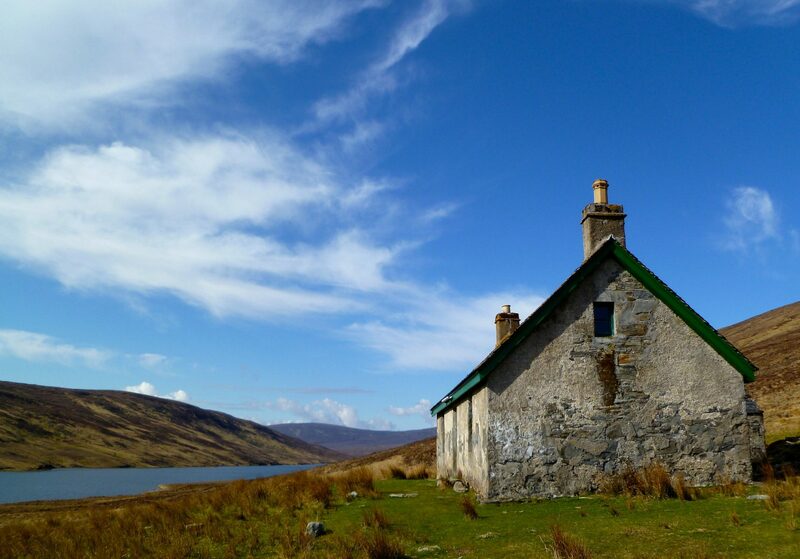 Knockdamph Bothy above the loch. 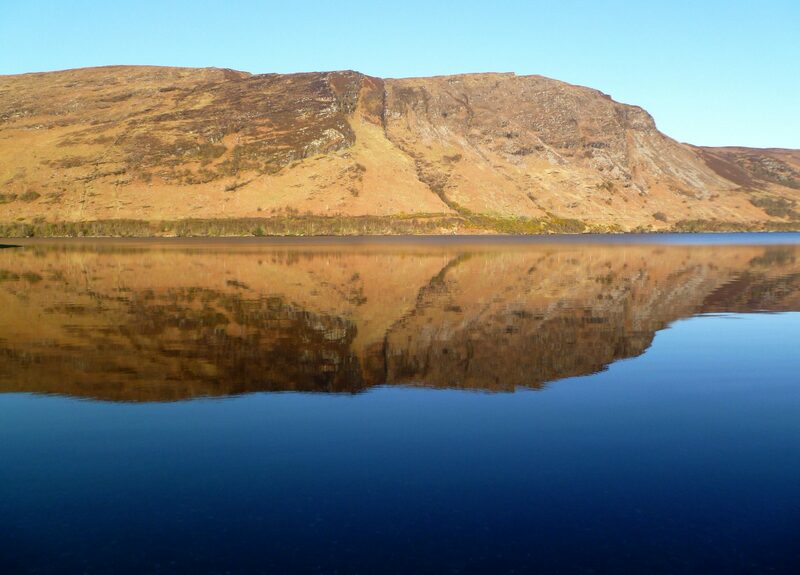 Loch Ailsh in Glen Oykel. 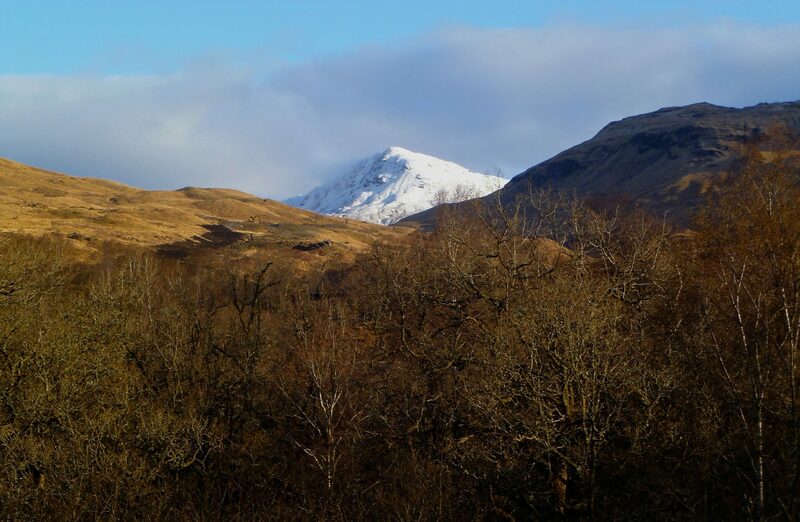 The face of Meall an Aonich. 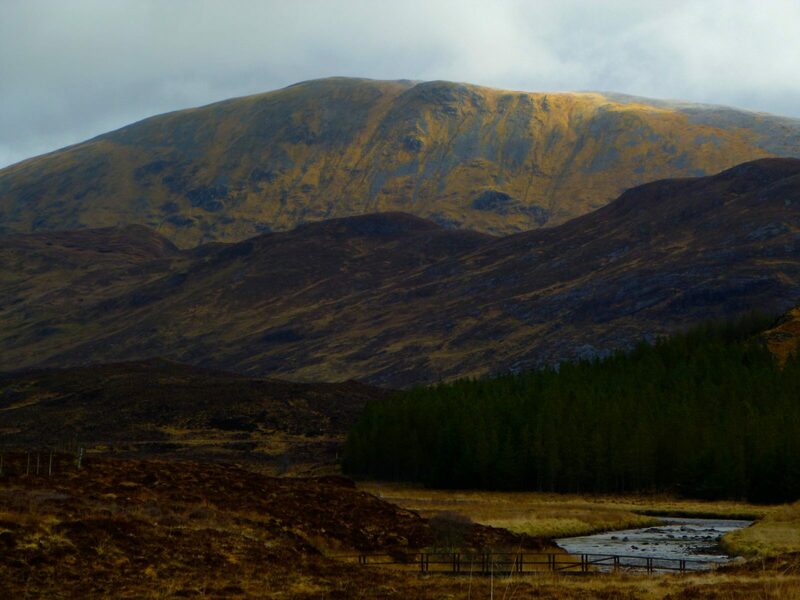 We’ll cross the Bealach Trallgil after woking our way around the head of the glen. Sometimes we didn’t have to wade the burns. The area had fine walking. Note Amy’s shadow; the sun poked its head out ever so briefly. The terrain was wild and rugged, but the walking was quite easy. Camp #19, May 12. 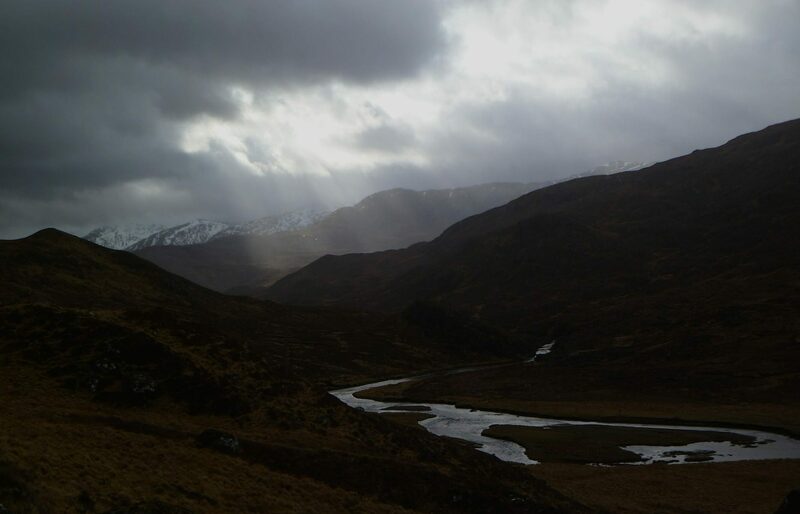 A brief flash of sun at the beautifully situated Glendhu Bothy. Early the next morning and the tiny hamlet of Kylesku across the end of the loch. No tightly packed hilltown (like those in Spain) for the Scots. The ground was saturated under the snow. The wind was blowing so hard that we had to find shelter behind a rock to look at the map. On the way toward Sandwood Bay on an easy path popular with day hikers. 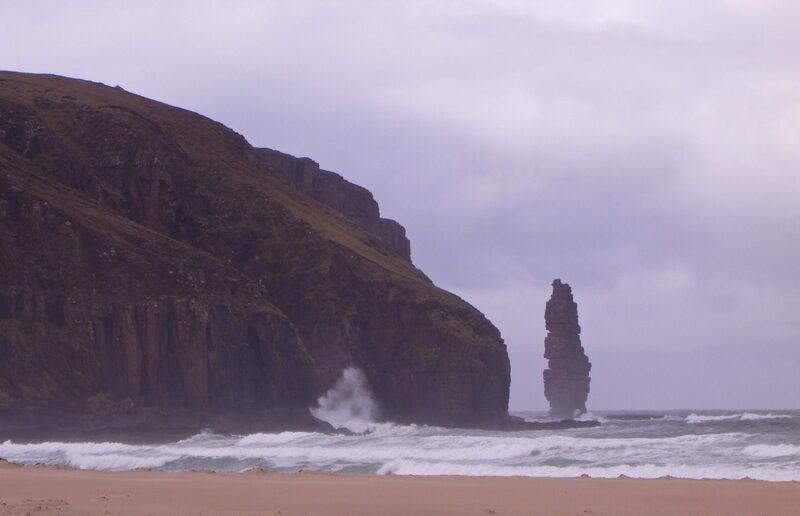 Am Buachaille, a fine sea-stack at the south end of the bay. 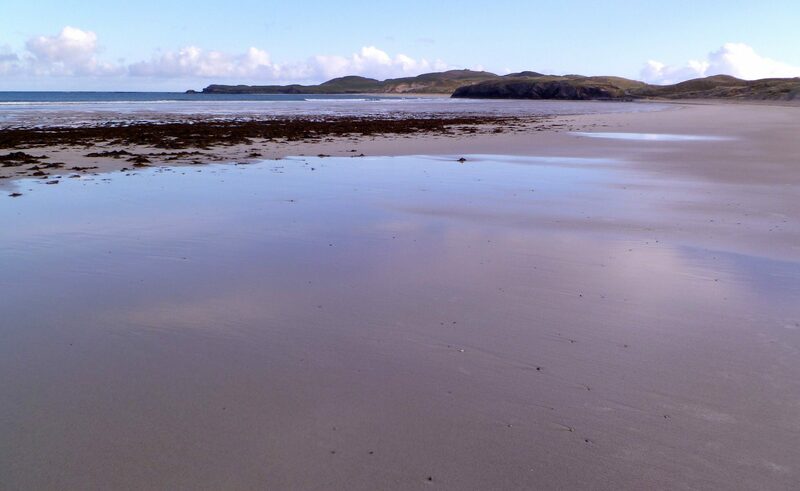 Sandwood is a lovely place; sea-stack, wide sandy beach, a loch outlet and no roads. 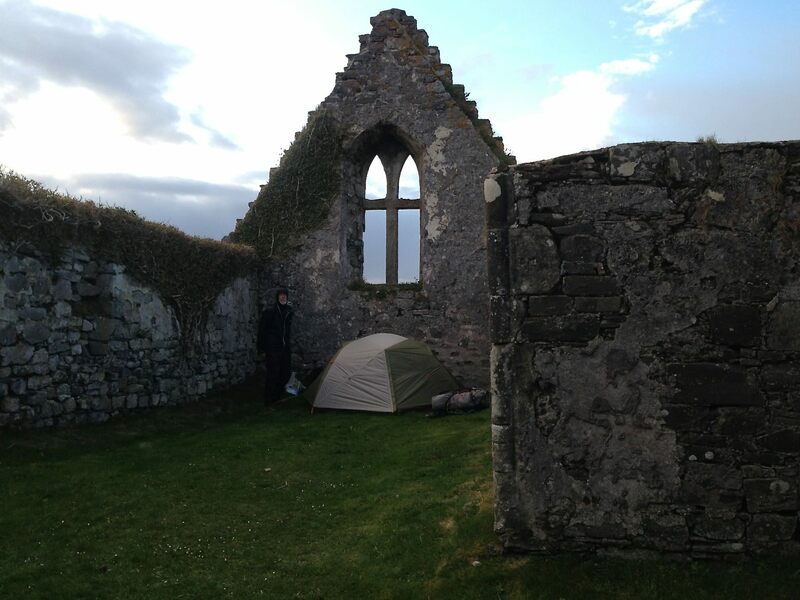 I fine campsite in the ruins of an old stone building. It was the only flat, level, and dry spot for miles around. 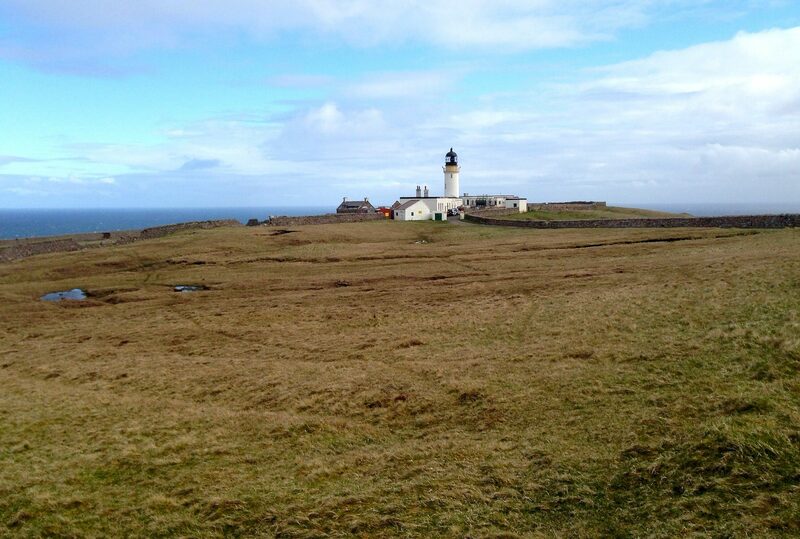 The Cape Wrath Lighthouse about 230 miles of walking from Fort William. The obigatory end of (this phase) of the walk photo. Camp #22, May 15. 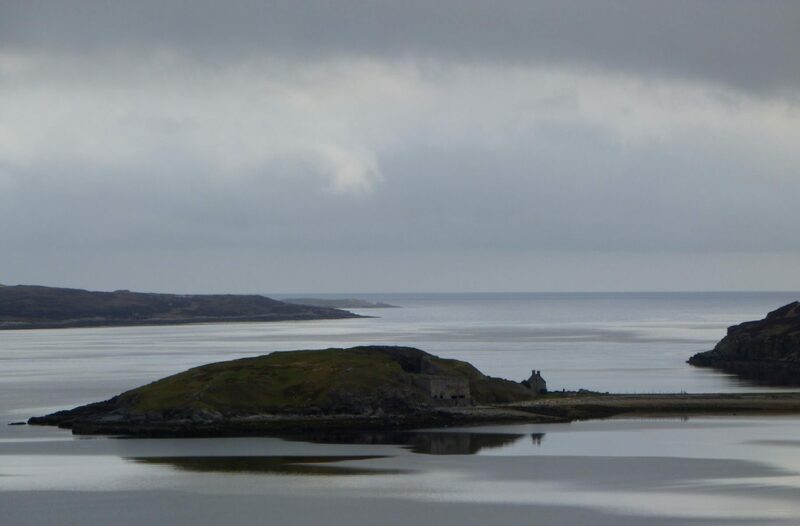 We walked into the nearby town of Durness for a meal, and then returned to Balnakeil to spend the night in the ruins of a church constucted in the early 1600’s. 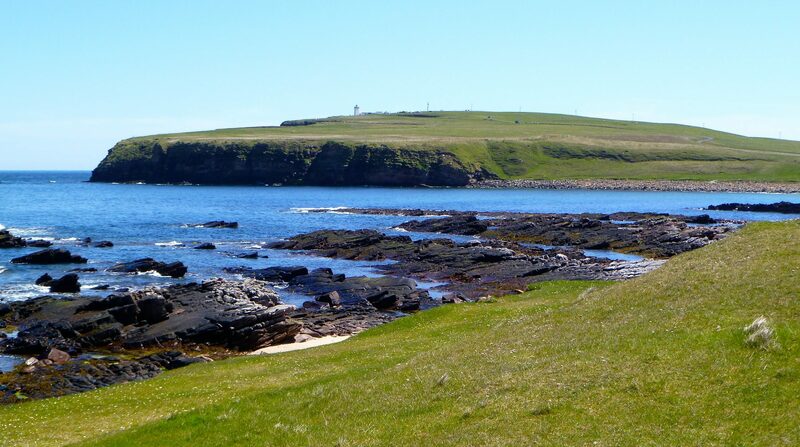 The next morning was glorious as we followed the coastline north toward Faraid Head. We were excited and relieved to see so much blue sky! By 9 PM, the rain and wind had stopped and it was totally peaceful, with Common Loons calling from the loch. 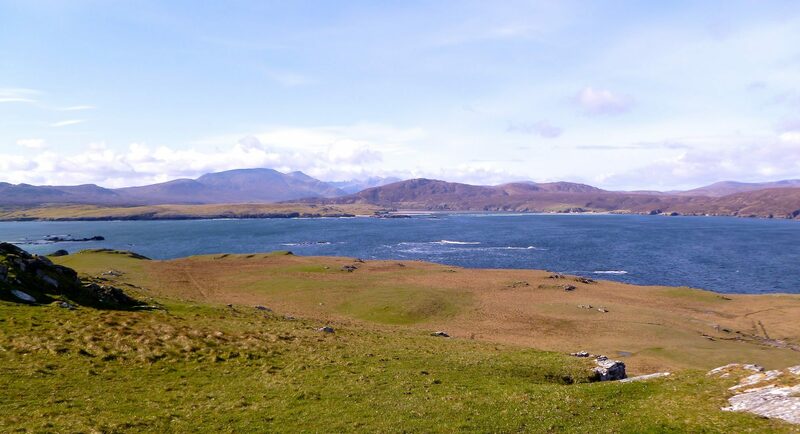 The next morning was beautiful as we headed north up the east side of Loch Eriboll back towards the coast. An old lime kiln and ferry building (used before the road around the loch was built). 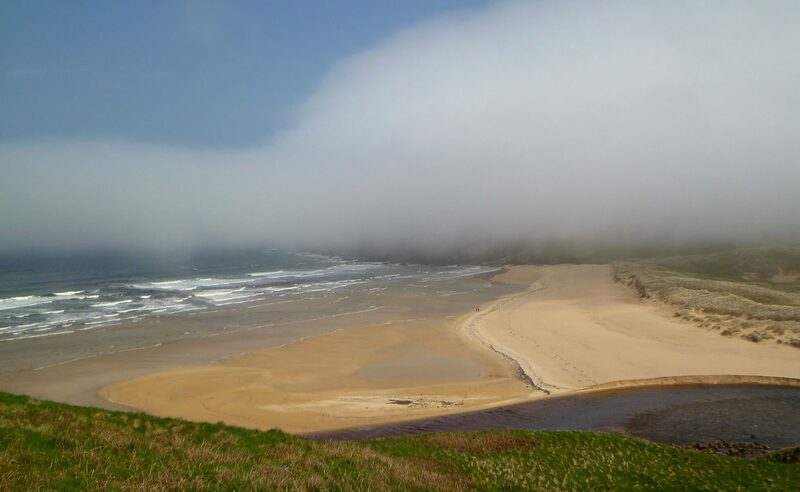 Fine coastal walking even in the fog. 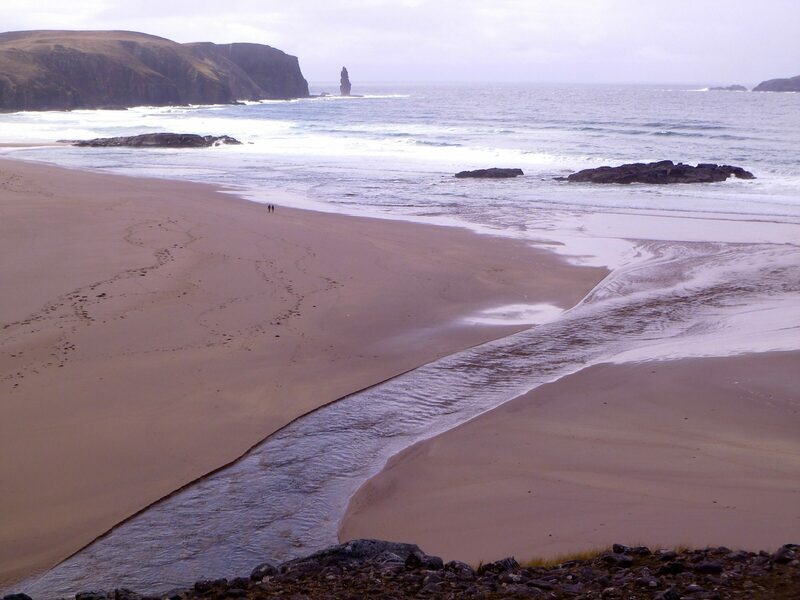 The beach at Strathy Bay, which we soon drop down to. Camp #26, May 19. Our fine camp on the beach at Melvich Bay. Maybe these will be a partial answer to the nuclear monsters we have built in the past. The wind was blowing the waterfalls back up the cliffs. Scrabster, the port facilities of the town of Thurso, the largest town since Ullapool. A place of massive historical importance. Anyway, it was a comfortable place out of the wind to eat lunch. 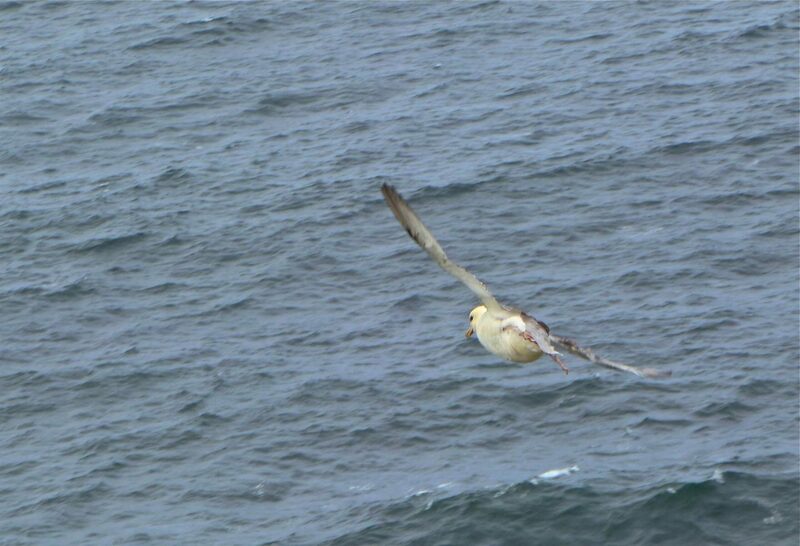 The birds really seemed to enjoy just floating around on the updrafts along the cliff faces. Finding ourselves a couple of days early for our booked train back to Glasgow, we decided to take the ferry from Gills Bay to the Orkney Islands. The whitecaps show that the wind was up agan. 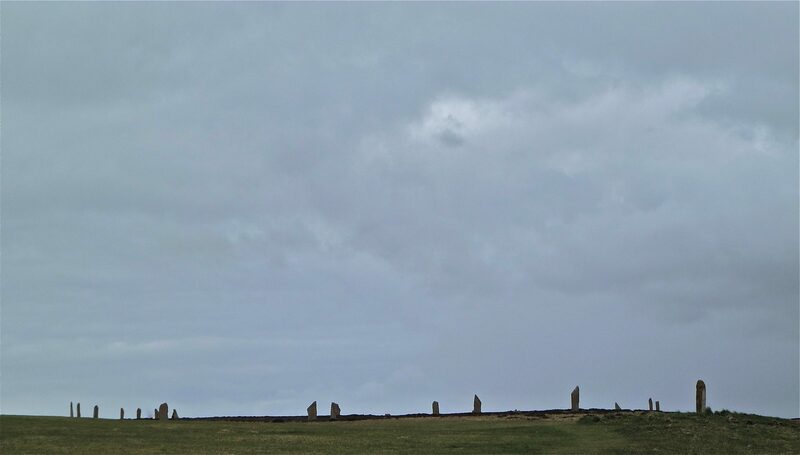 The 4000 year old Ring of Brodgar. Camp #30, May 23. A nice sheltered place to camp in the village of Dounby, where we had a hot meal in the local hotel. 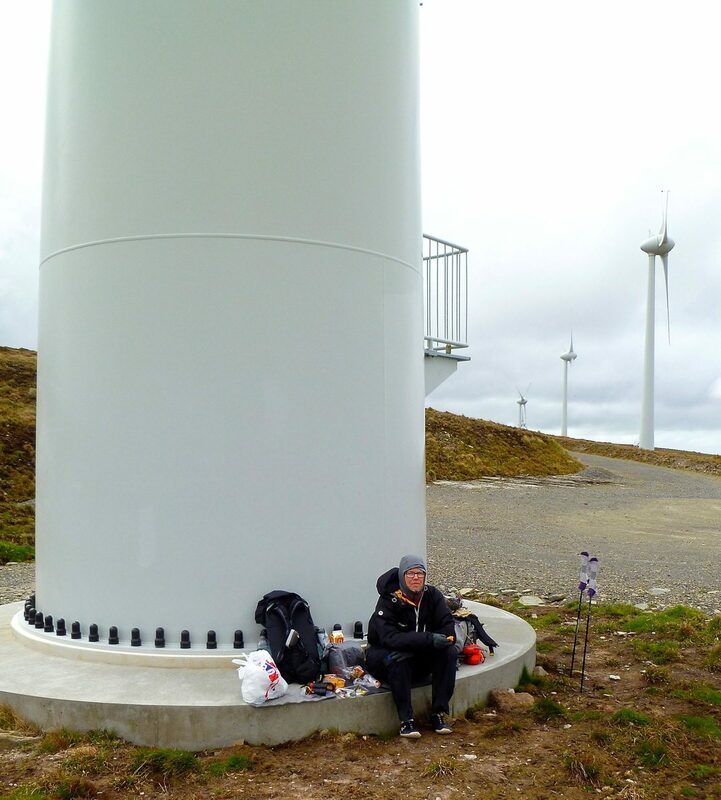 Lunch at the base of a wind turbine, out of most of the wind. 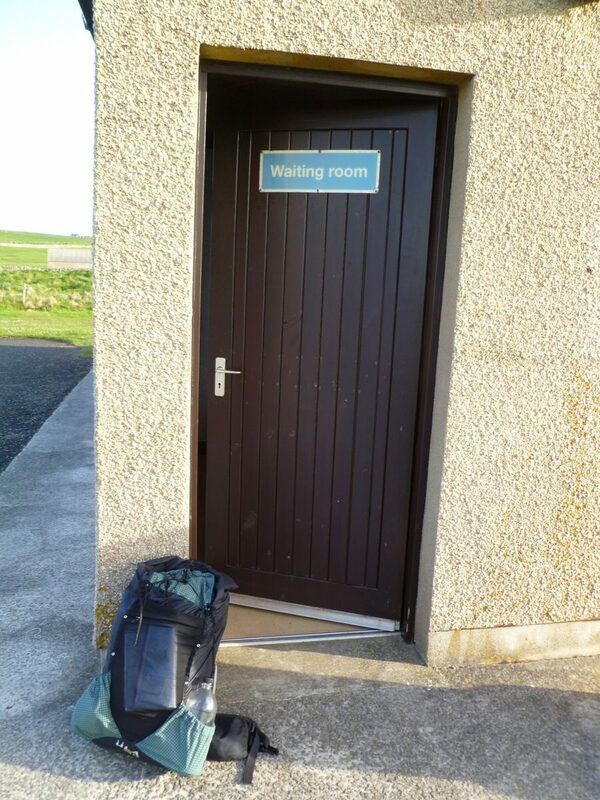 We walked back to the “Wating Room” by a different route. 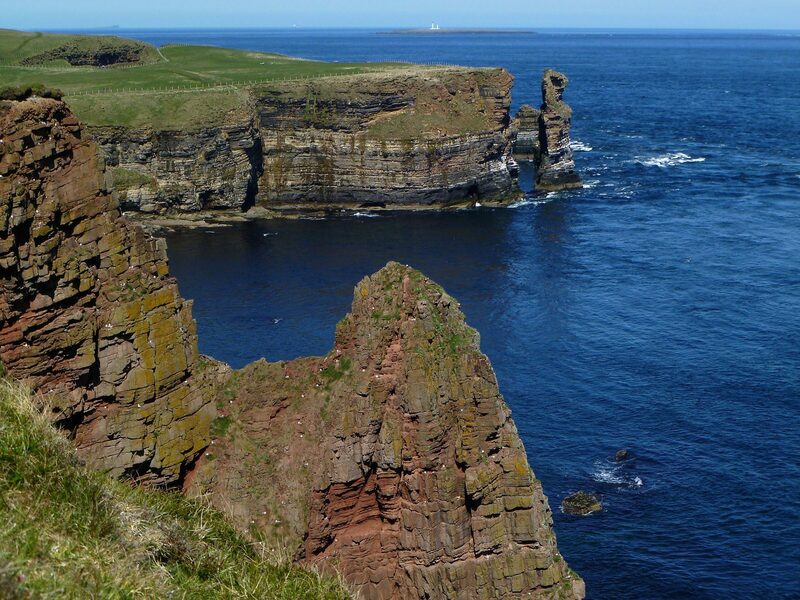 Duncansby head, the northeastern-most point on Britain. 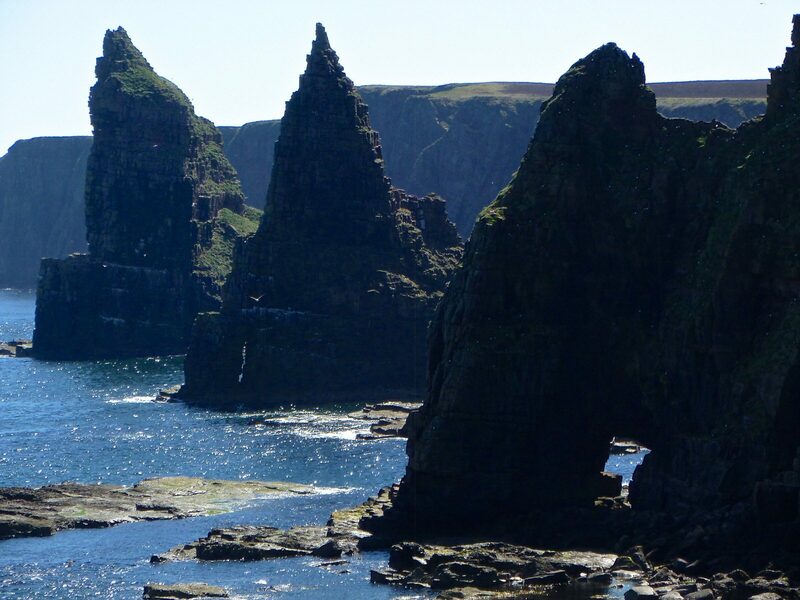 The Thirle Door and the Stacks of Duncansby. 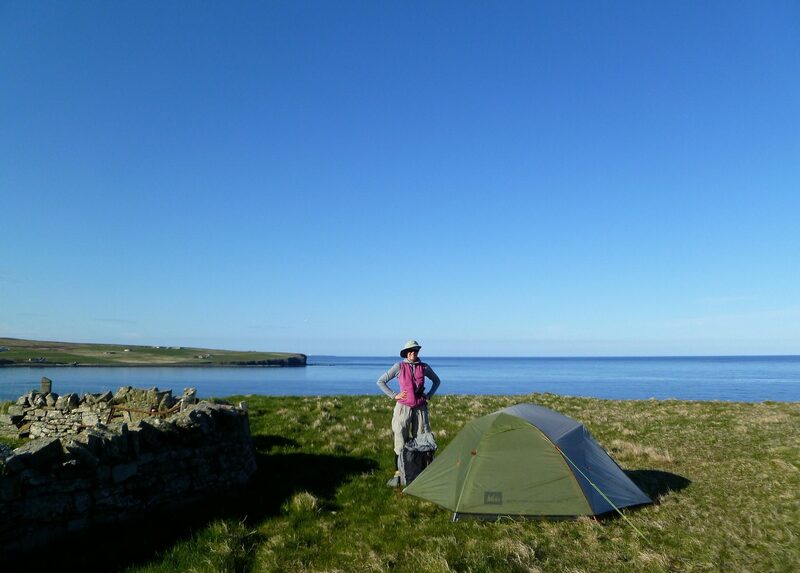 A 5 star campsite at Ness Head. No wind. 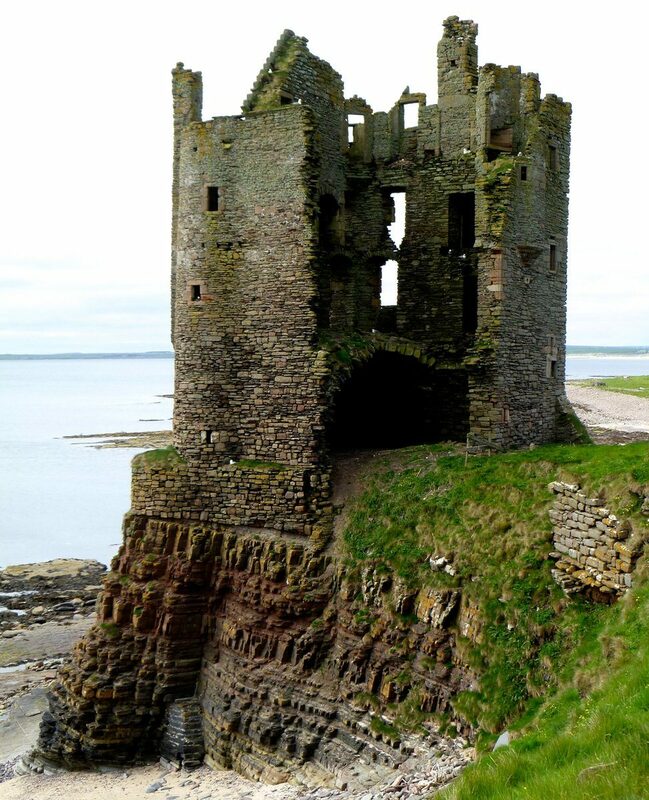 The remains of Keiss Castle. The 5K long beach at Sinclair’s Bay. 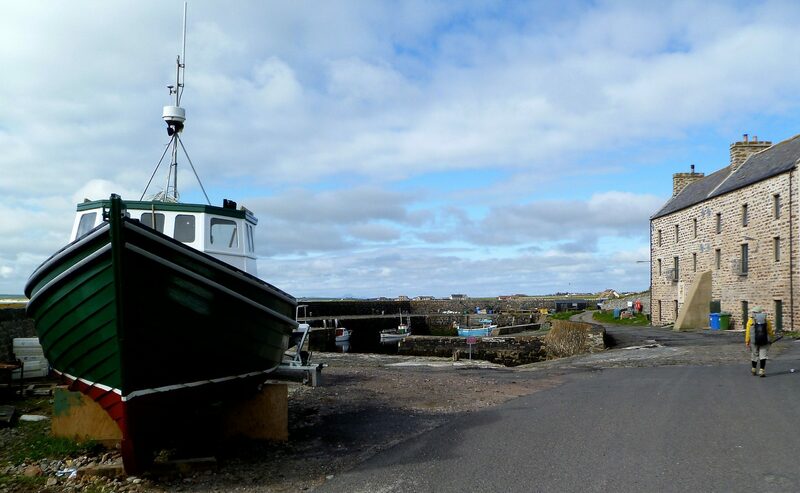 The slightly scruffy town of Wick and the end of our walk. On a good trip, I’ll occasionally feel that I’m the luckiest person in the world. On a great trip I’ll feel that way every day. While I enjoyed our hike in Scotland, I never achieved the luckiest person in the world feeling. A few things conspired to put a damper on things. The most important was the weather. The rainfall in May of 2013 in Scotland was 139% of historical average. Our rain gear and tent worked, and we were never cold, so at any given time the weather was not an issue. But day after day of cool, grey, rainy weather started to feel very dank. 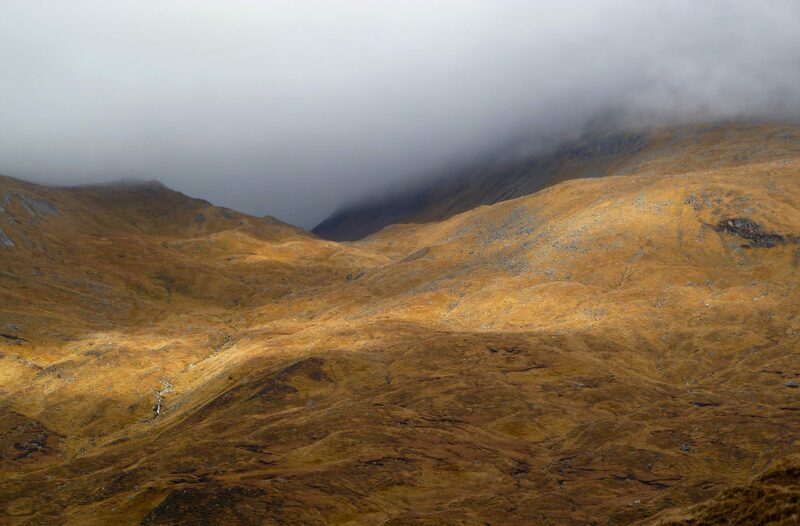 On the Cape Wrath Trail, our notes say we had 80-100% cloud cover on 12 of 17 days. Only two days were “mostly sunny”. The clouds were usually low, seriously obscuring views of the mountains. Weather that includes bursts of rain alternating with dry and sunny spells is more fun than hours of endless drizzle. Call me a California wimp. 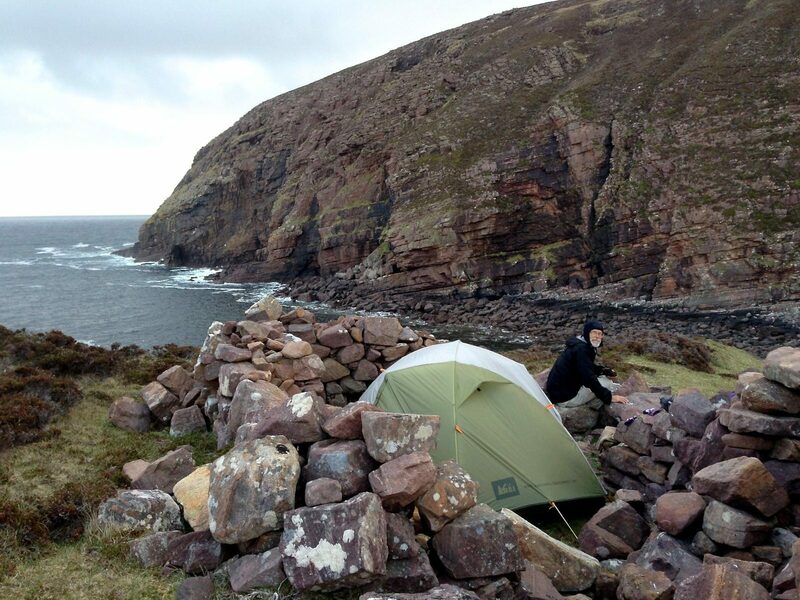 A second thing that put a damper on my enthusiasm for hiking in Scotland is the extreme paucity of campsites. 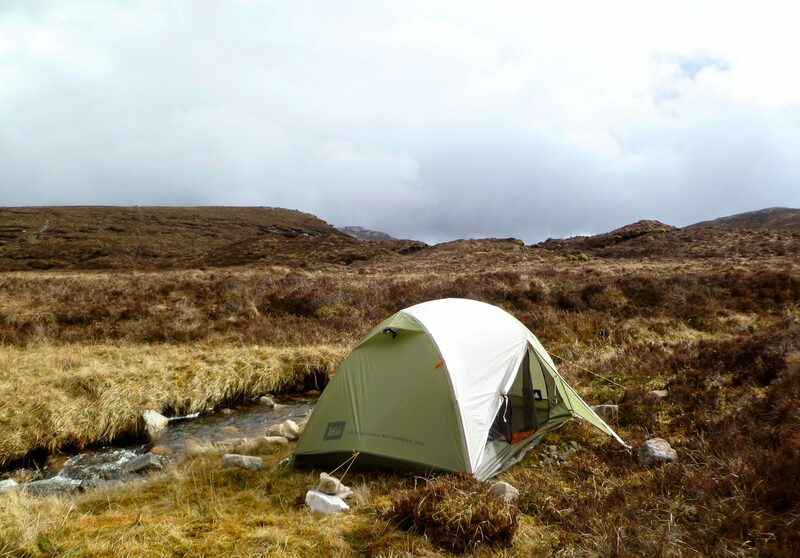 The saturated peat and heather habitat is just not conducive to laying down a tent, and it was not unusual while on the Cape Wrath Trail to walk for a couple of hours without an opportunity to camp. For this reason, we found it necessary to plan our daily stopping point well in advance, foregoing our preferred spontaneity. We went in early spring to avoid midges, so we took our trip before the flowers bloomed or the deciduous trees flushed their leaves. The landscape is a very pleasing and lovely palette of soft textures and soft shades of grey and beige and brown; but I did start to crave some highlight colors or strongly contrasting textures. 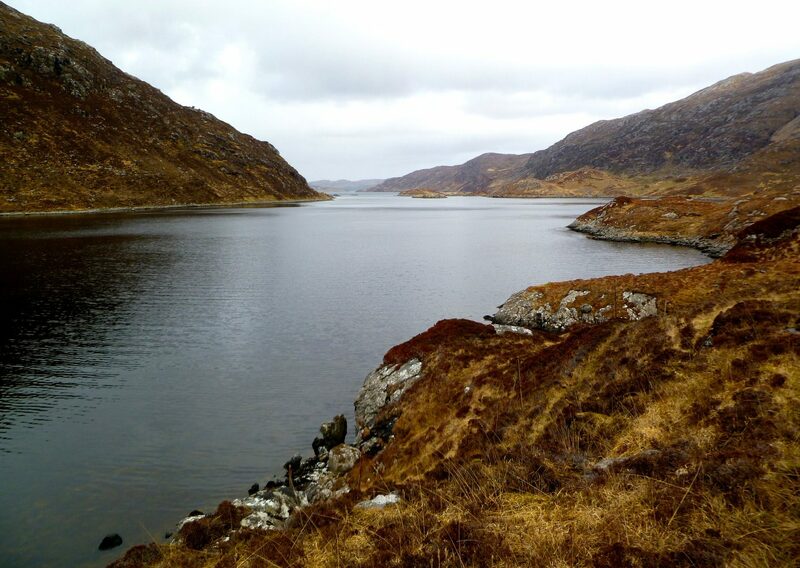 On the Cape Wrath Trail, my favorite places, by a good margin, were the tidal lochs, which had great diversity of scenery and abundant birds; my most memorable spots were along Loch Linnhe, Sourlies Bothy on Loch Nevis, the trail along the edge of Loch Hourn, the trail along the edge of Loch Duich near Shiel Bridge, and especially Lochs Beag, Glencoul and Gleann Dubh. On the whole, I found the scenery on the North Coast Walk to be more satisfying than the scenery on the Cape Wrath Trail; again that assessment might be entirely different if I had been able to see more of the mountain scenery. And finally, something that dampened my enthusiasm was, in the grand scheme of things, really not important. In all of our long hikes we have never had a local person be unwelcoming. On this trip we had two different women come out of their houses to scream and curse at us because we were, legally, crossing their fields. Another person, upon inquiry, told us we were not permitted to camp anywhere in a valley and must return 5 miles to a caravan park. We had a bartender at the Rhinconich Hotel be so rude to us that we couldn’t wait to get out of the building, even though it was raining steadily and blowing a gale. And we met several other shopkeepers who were very curt. I’ve hiked enough to come to expect a neutral if not warm welcome and I was really taken aback by the unfriendliness. James just let it roll off his back, calling them the local cranks, but it got under my skin. In hindsight, if planning to spend a month in Scotland I would now choose to stay close to the coast instead of hiking in the mountains. My favorite parts of this hike were on the coast, and the weather on the coast is on average better than in the mountains. 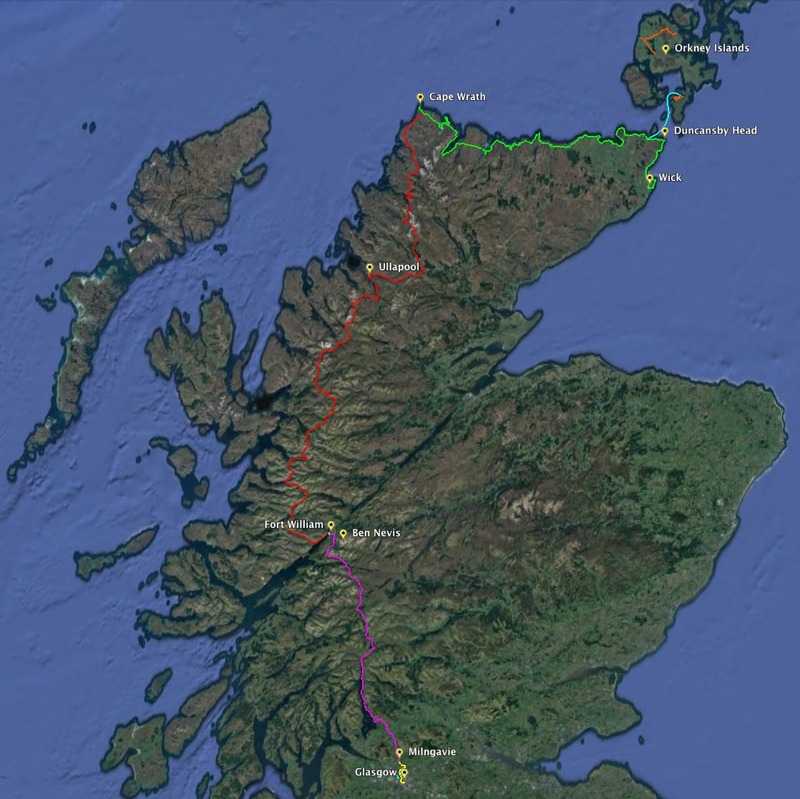 I would use the Scotland’s Coastal Path website to plan my trip. I personally enjoyed the walk and am happy to have done it. The CWT was scenic, mostly away from the visible trappings of civilization, had few other walkers, and had a lot of integrity. Having heard so many positive things about walking in Scotland from other hikers, I was pleased to finally get there and see some of it. Other than the weather, the walking was a lot less challenging than I expected. 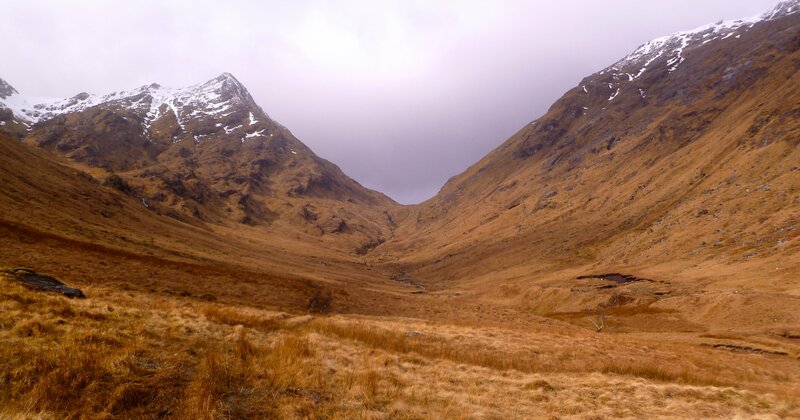 More difficult walking could be done climbing particular routes on at least some of the Munros, but from what we have been told, even most of those can be climbed via non-technical routes. The mountains have a stark and isolated beauty to them, but are rarely truly dramatic. 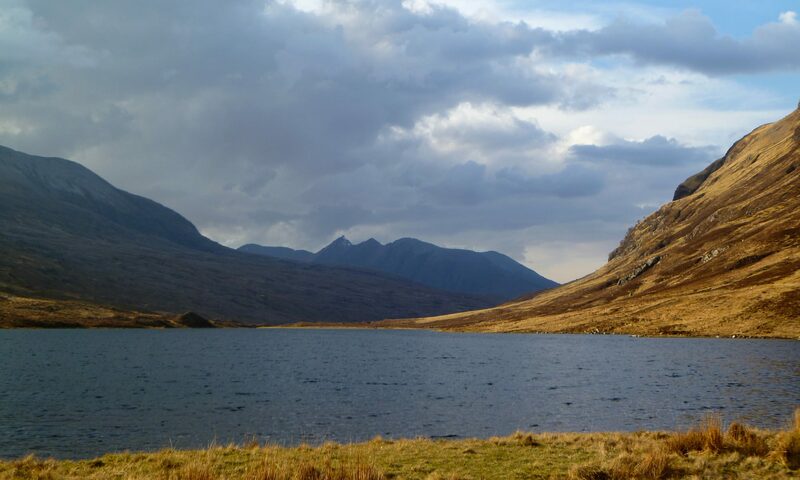 The numerous lochs and lochans add a lot of visual interest to the landscape. The colors are muted, dark, and harmonious. The landscape was very pleasing, at least when it was not completely obscured by cloud. In particular, the coastal walking was quite fine and a visual treat. Would I take another long walk in Scotland? Maybe, but there are a lot of other places to see and primarily because of the weather I did not leave with the desire to get back there as soon as I can. But, I have zero regrets for having taken this trip. Would I recommend the walk to others? If your walking time is constrained by life’s obligations, no. Go somewhere where the trip offers more intense highlights. 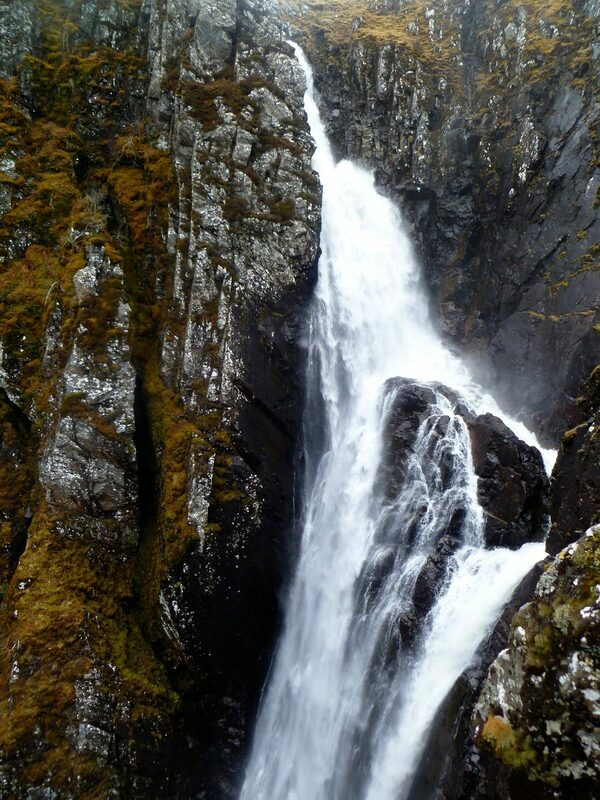 However, if you do have time to do many trips, yes, go to Scotland and hike the CWT. If nothing else, I had a great sense of accomplishment when we reached the lighthouse and completed the walk, more so than on many other walks I have done. The rewards offered by the CWT are subtle, but very satisfying. We began our walk by hiking the Kelvin River Walkway (KRW) from Glasgow Central Station to Milngavie. 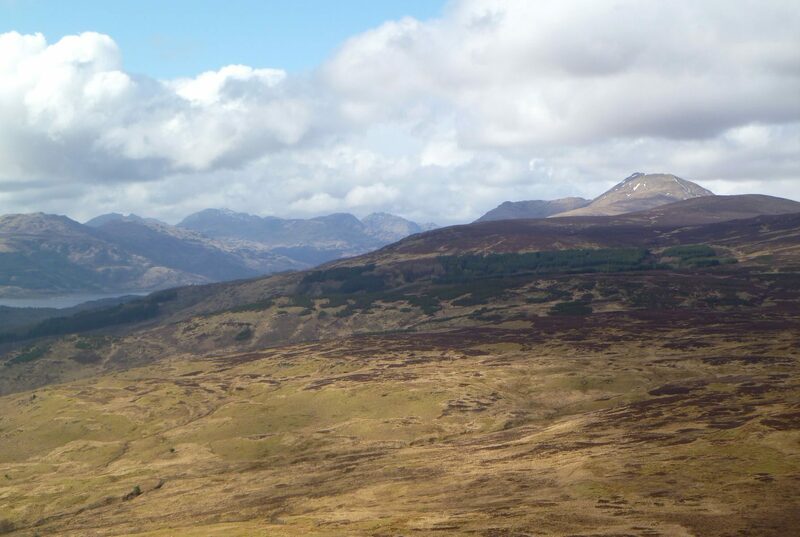 We then hiked the West Highland Way (WHW) from Milngavie to Fort William, the southern terminus of the Cape Wrath Trail (CWT). 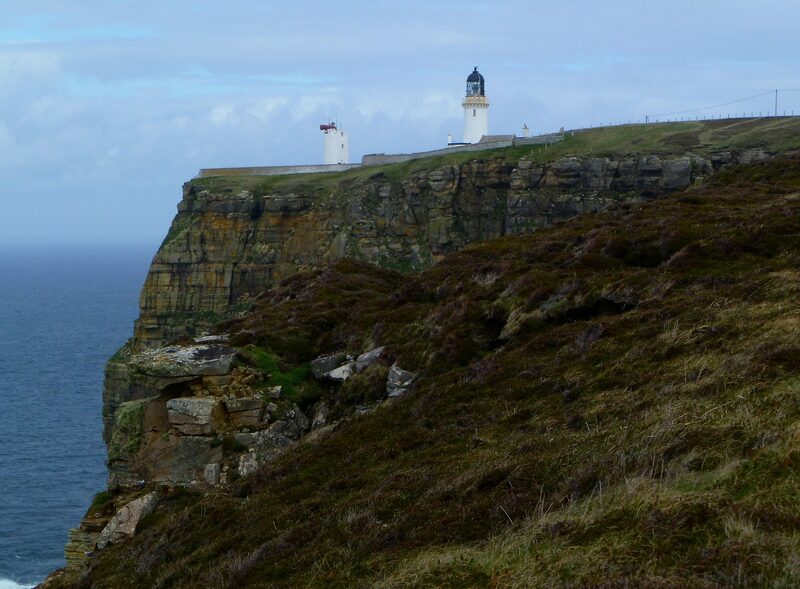 We followed the CWT through the western Scottish Highlands to Cape Wrath, the most northwesterly point on Great Britain. 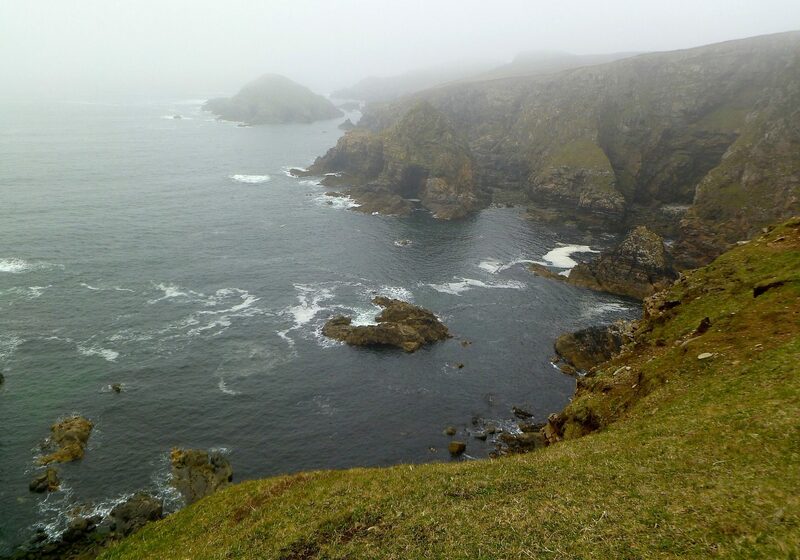 Turning east, we walked along the north coast to Duncansby Head, the most northeasterly point on Great Britain. 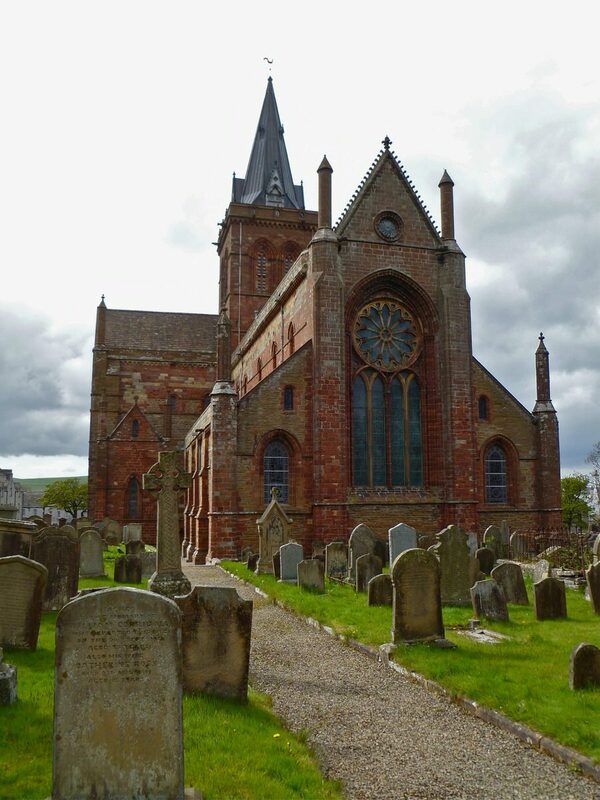 Finally, we walked south along the east coast to the town of Wick where we caught a train back to Glasgow. 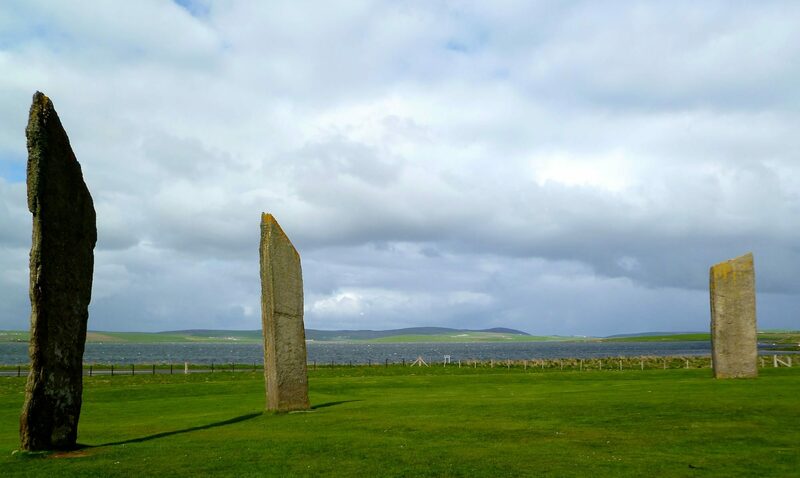 Along the way, we took a side-trip via a ferry to the Orkney Islands where we spent several days visiting some of the archeological sites. This is a local 11.5 mile trail between Glasgow and Milngavie, the southern terminus of the WHW. 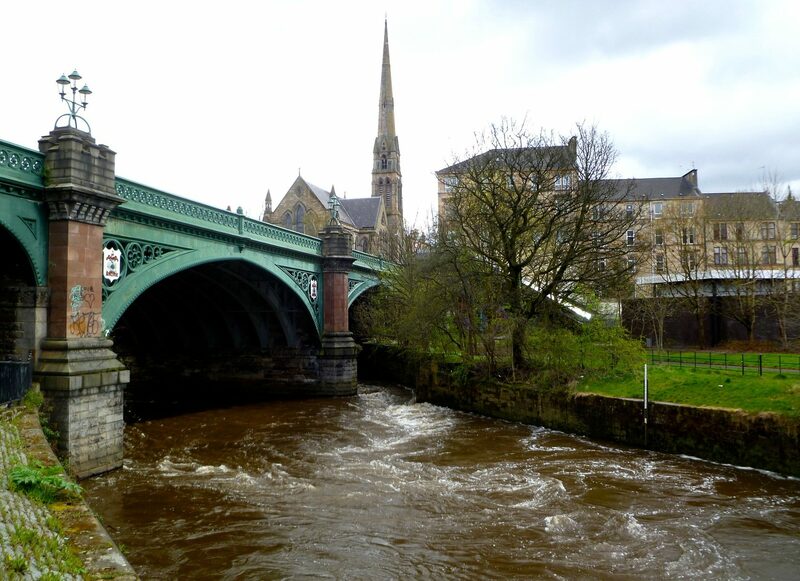 The KRW starts along the River Clyde in central Glasgow and primarily follows the banks of the Kelvin River. By using this trail, we could start our walk in Glasgow as soon as we got off of our flight from the US. 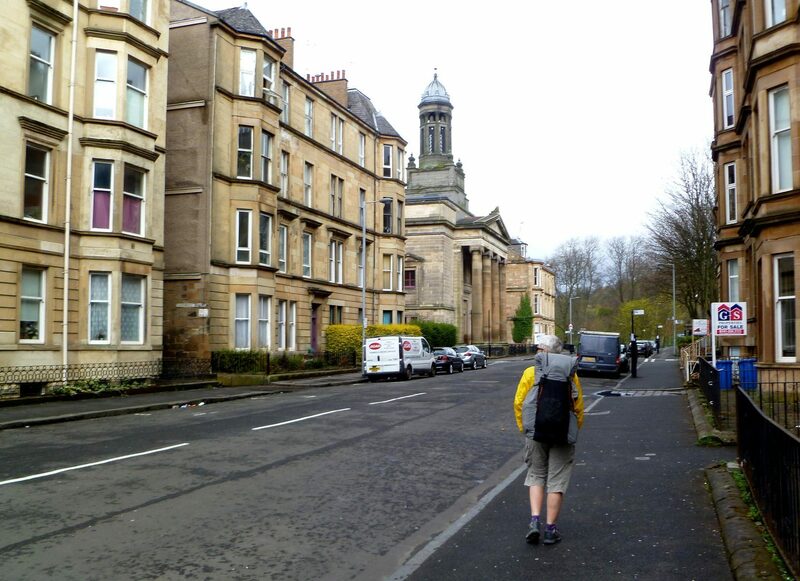 While the route is pleasant, it is nothing special although it does deftly avoid significant road walking while wending its way through Glasgow. There are a few signs and waymarks, but a map was useful. We left Glasgow a little before noon and arrived in Milngavie before 4 o’clock. 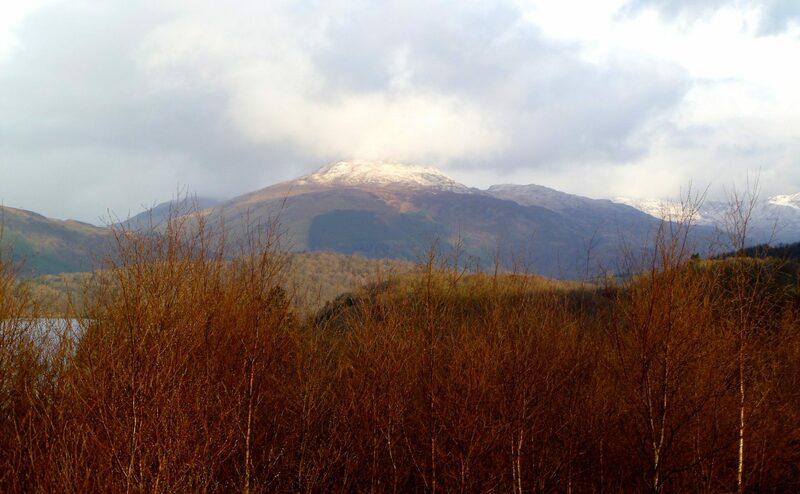 The WHW is a British National Trail. It is very popular, well way-marked, and well maintained. The trail is about 92 miles in length not including diversions for provisions, lodging, climbing peaks or visiting distilleries. 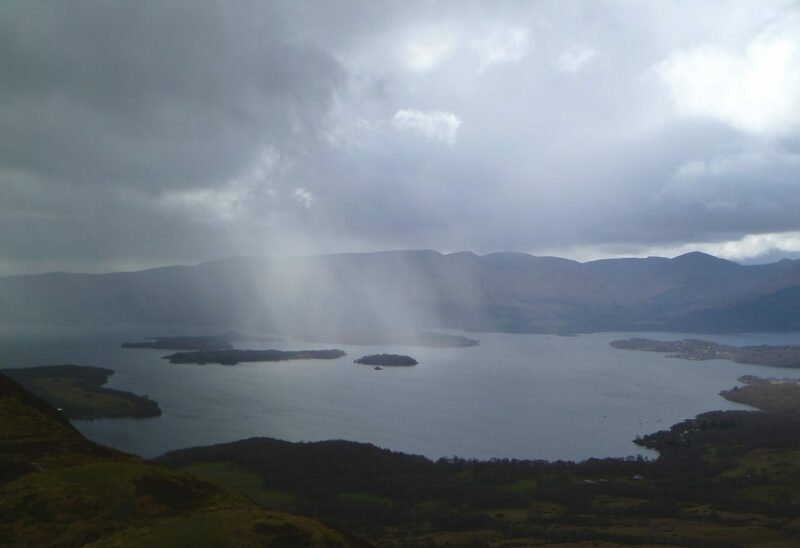 Technically, the walking was easy except along Loch Lomond where the tread was rough and quite slippery in a few places. The scenery was mostly good and was excellent in a few places. 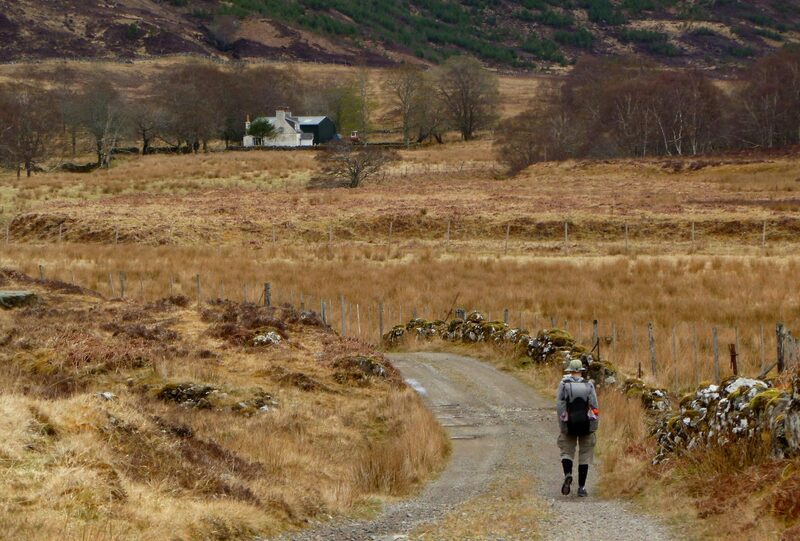 While the WHW is often close to a road, there is very little road walking except at the very end approaching Fort William. 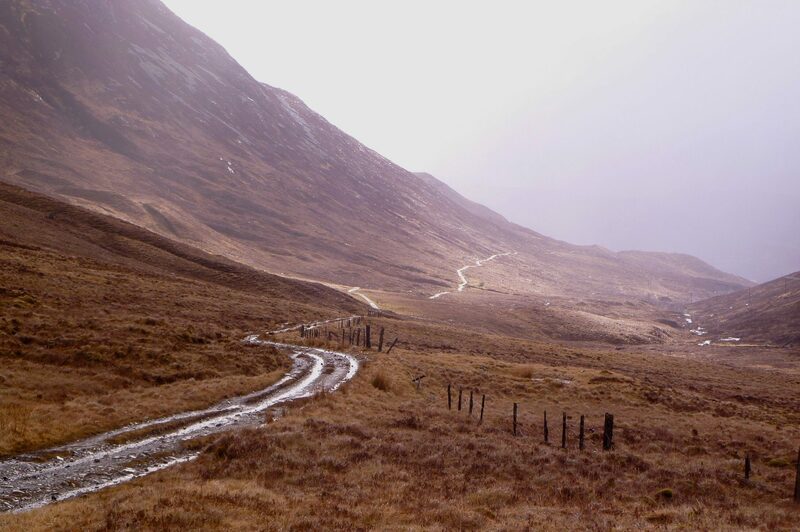 Why the WHW is routed on the road is a mystery as there is a fine off-road alternate into central Fort William. We did not find the presence of nearby roads to be troublesome except on a very few occasions when road noise was a bit too obvious. 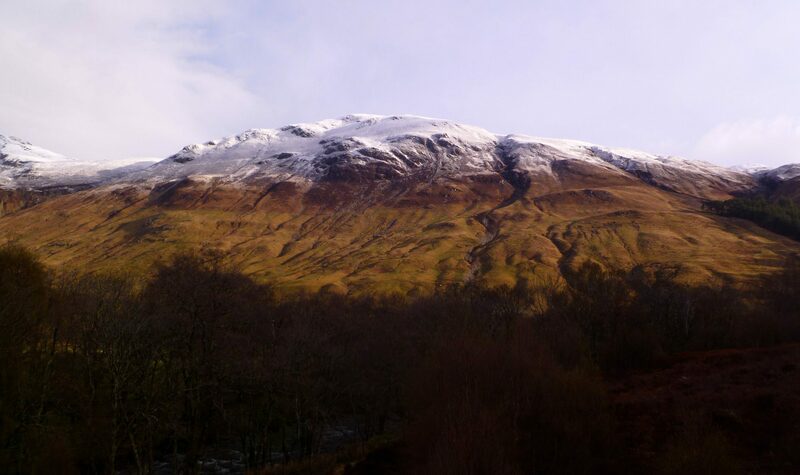 There are diversions available for those who wish to bag a Munro or two, including Ben Nevis (1,344 meters (4,409 feet)), the highest point in the British Isles. 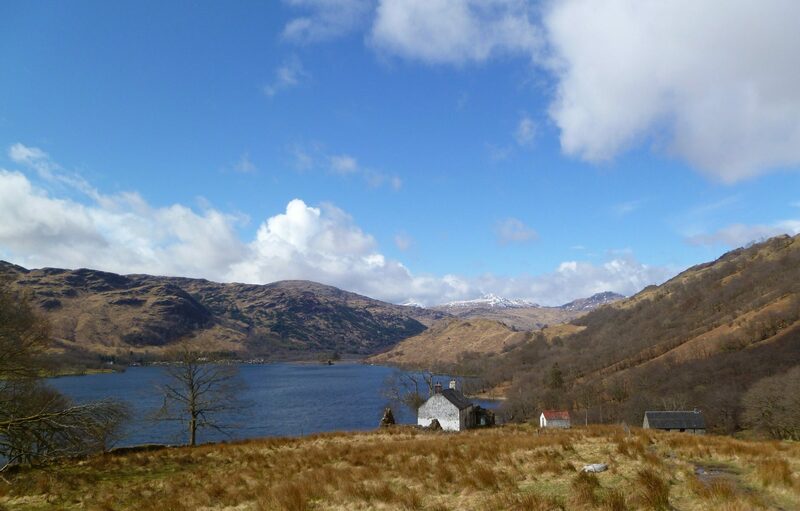 There is also a guidebook titled Not the West Highland Way that describes alternatives for many legs of the WHW for those who want a more off-the-beaten track version of the route. 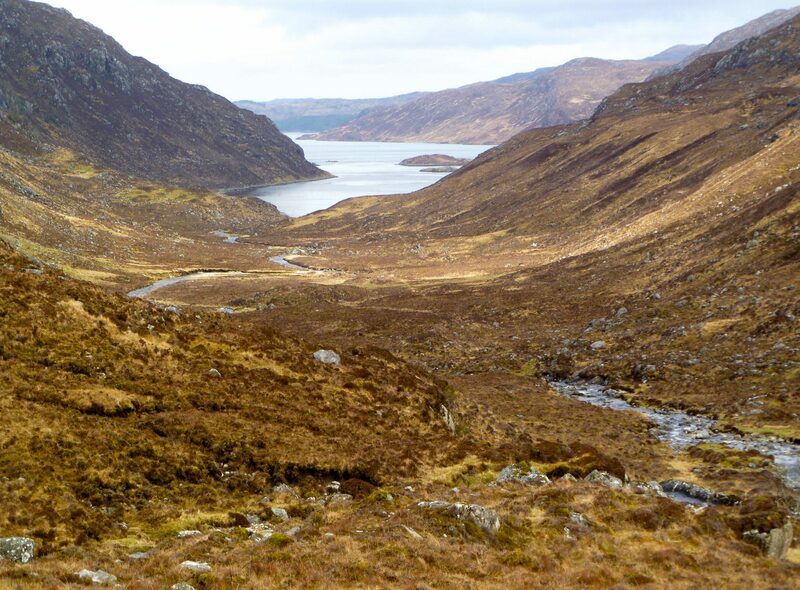 As the core of our walk was to be the Cape Wrath Trail itself, we chose to simplify our pre-trip planning efforts and walk the standard WHW route, as for us was to be mostly an access route to the CWT. 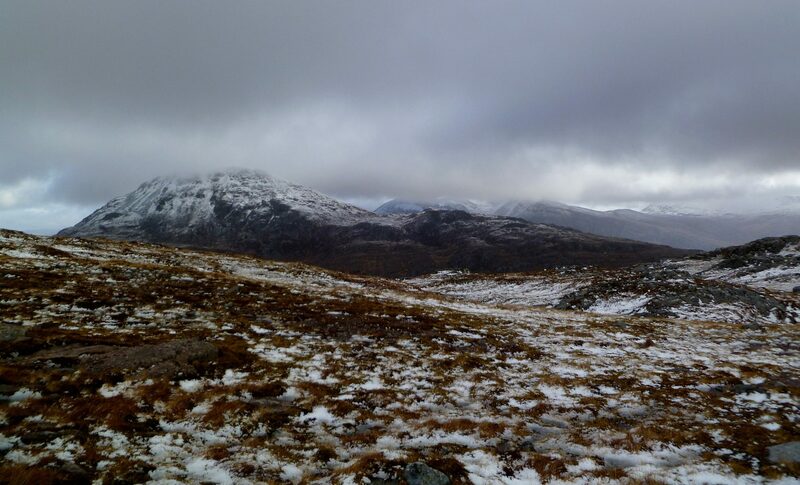 We had planned to climb Ben Nevis, but a lot of snow on the mountain and crummy weather scuttled that option. It took us about 4.5 days to complete the WHW. 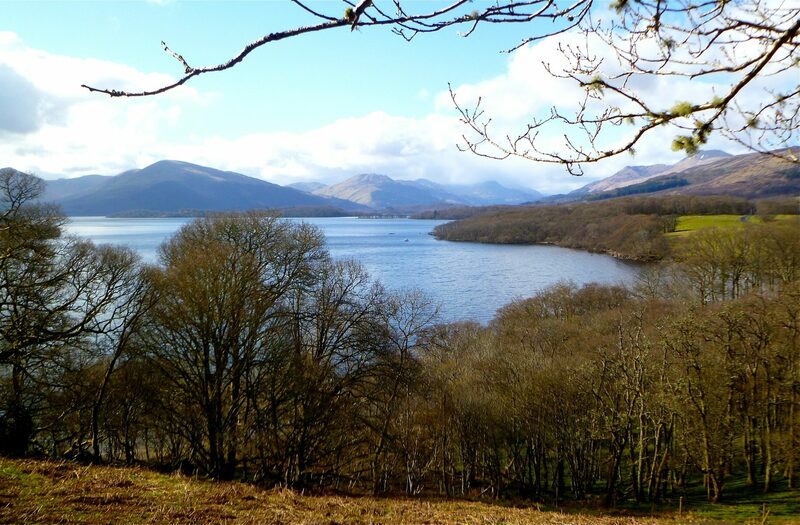 If you plan to camp on the WHW, be aware that for a significant portion of the trail along Loch Lomond, camping is restricted to designated commercial sites or areas outside of a mapped red zone. The red zone includes the lakeshore and extends varying distances up the slopes of the mountains to the east of the trail. While we were successful in finding a fine campsite just outside the red zone, options were extremely limited due to terrain. Fines are threatened for those caught camping illegally inside the red zone, although we never encountered any officials. The CWT is not a way-marked trail. 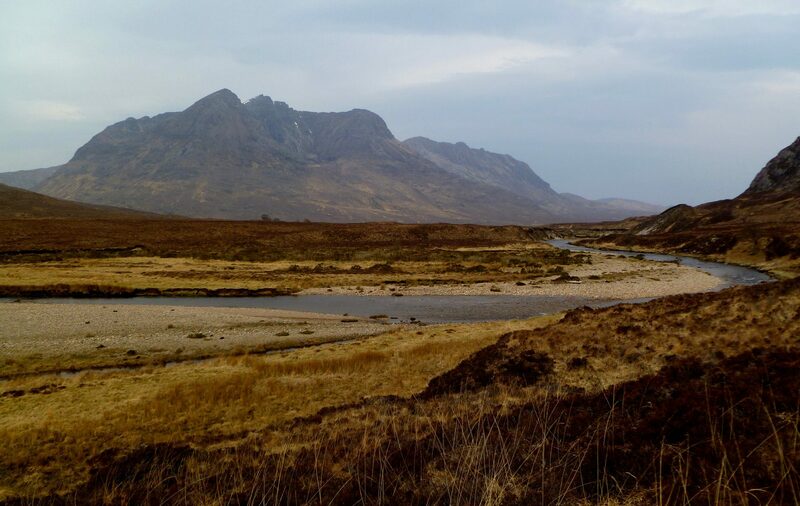 It is a number of mapped routes through the western highlands between Fort William and Cape Wrath, following a mix of high and low quality jeep tracks, high quality footpaths, faint use paths, and off trail travel. There are many variations. As we walked it, the CWT was 231 miles in length. 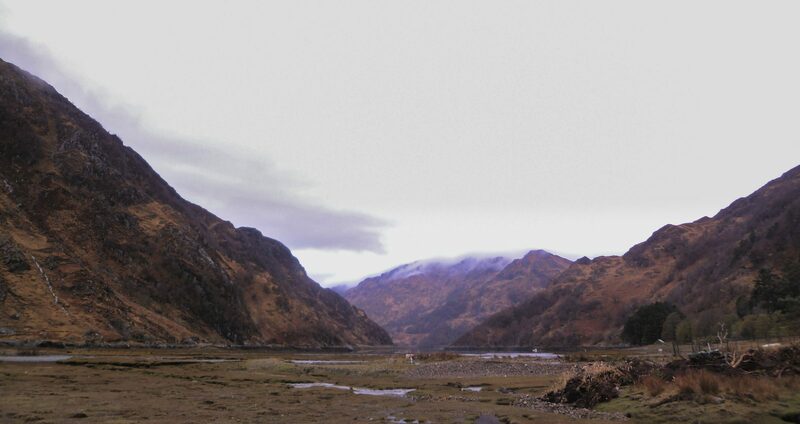 The original concept for a CWT was described in a photo essay book, The Cape Wrath Trail, 1996, by David Patterson. Subsequently, in 1999, Cicerone Press published North to the Cape by Brook and Hinchliffe, which described a somewhat different routing and also included a number of alternates. 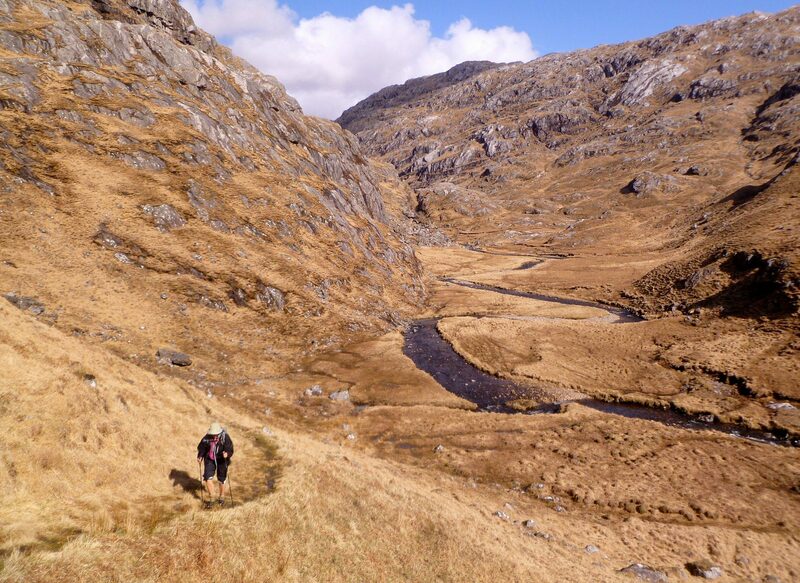 In April 2013, updated in 2016, Cicerone published a new guide The Cape Wrath Trail by Iain Harper, with yet another version of the CWT, which among other improvements, eliminated some pieces of road walking in favor of off-trail travel. Additional versions of the trail have also been described on several websites. At least one of these options has a vastly different start, heading northeast out of Fort William along the Great Glen Way, instead of west or northwest as other CWT versions do. There is overlap between all of the authors’ described routes. 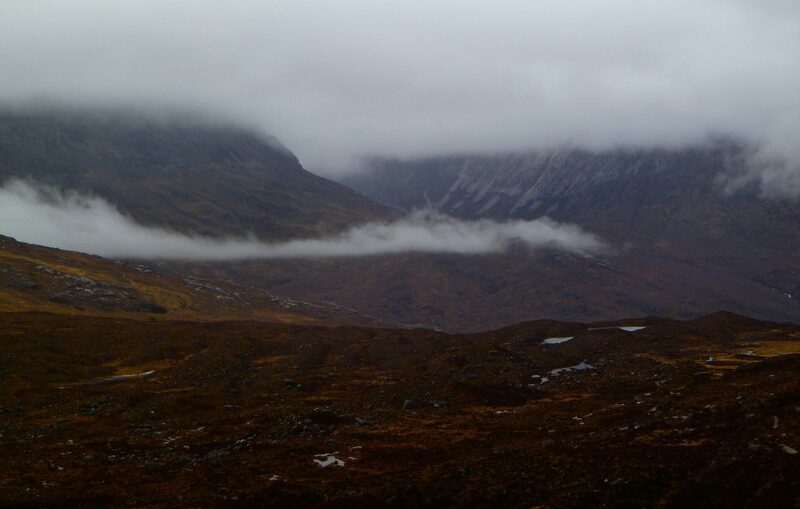 We avoided circling north of Beinn Eighe between the Ling Hut and Kinlochewe because of really bad weather and warnings in the guide about potentially dangerous stream crossings in high water conditions. 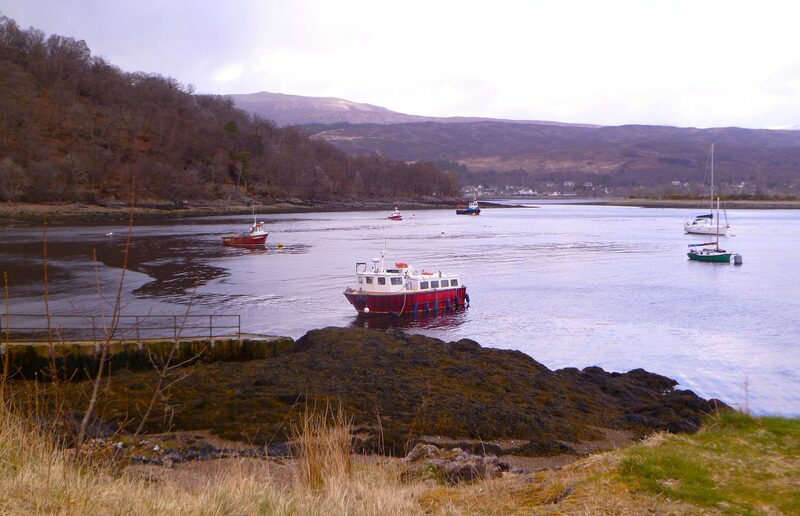 We took the alternate to Ullapool in order to buy groceries. We took the alternate to Kinlochbervie in order to buy groceries. 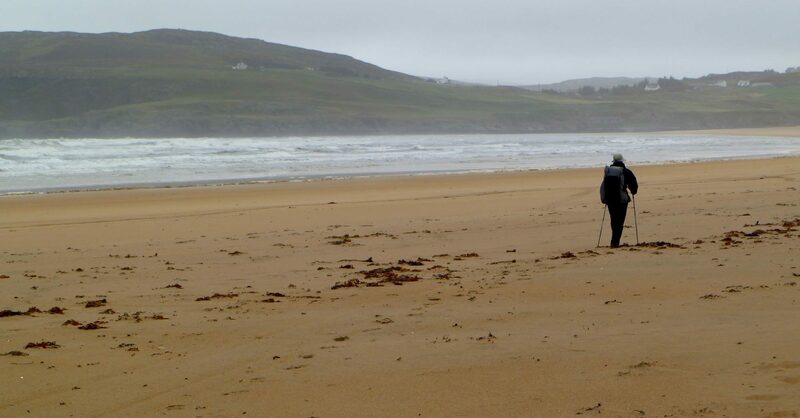 We followed our own track between Sandwood Bay and Cape Wrath instead of the published more interior route because the scenery on the coast was better and the weather was good enough that we didn’t need to use the Strathchailleach Bothy. 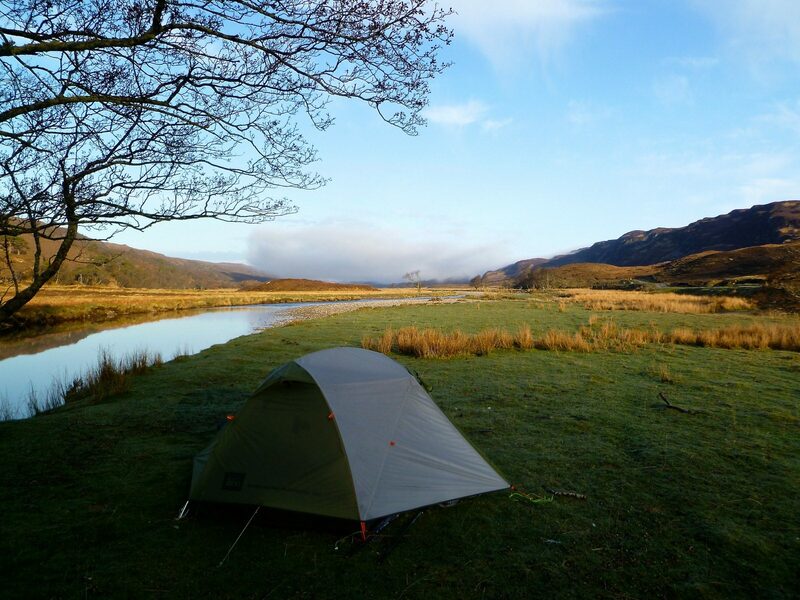 The CWT is billed as being ”Britain’s toughest trail”. 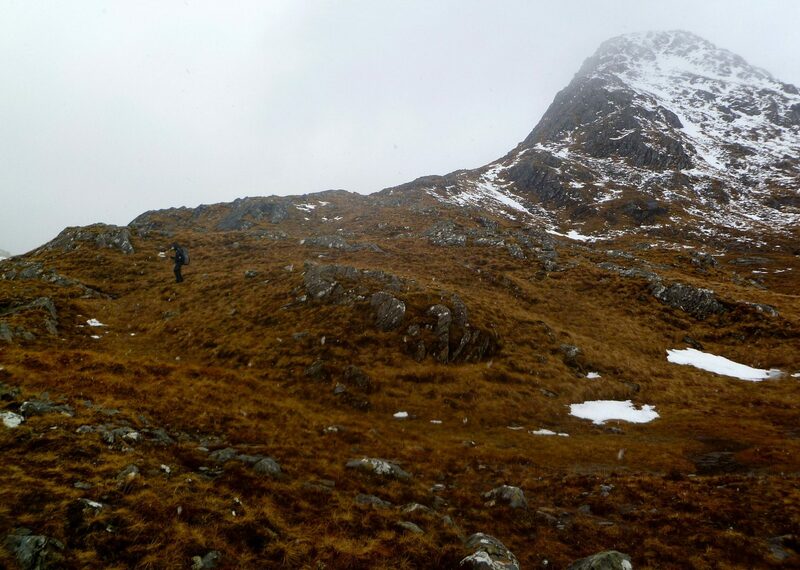 Maybe it is the toughest Scottish long distance route published in a book, but we did not find the terrain to be a technically challenging. The difficulties of this walk are primarily driven by the weather. 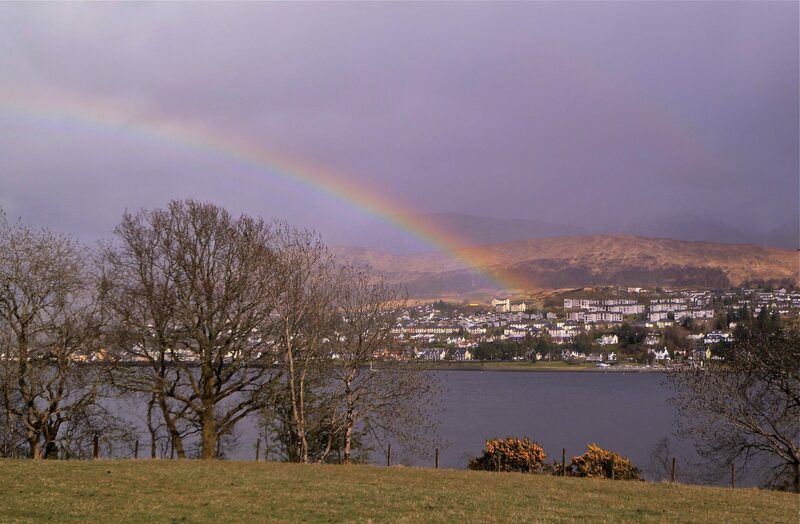 Unpleasant weather is a fact of life in Scotland and the chances are extremely high that there will many rainy days and at least a couple of days with really foul weather. Bad weather can include rain of varying intensity, fog, mist and whiteouts, gale force winds, hail, and snowfall, often in combination. When it rains, the moors and many of the footpaths will be soggy and as a result, your feet are most likely going to be saturated. The sogginess of the ground was amazing, including the fact that even steep hillsides held vast quantities of gravity-defying standing water. 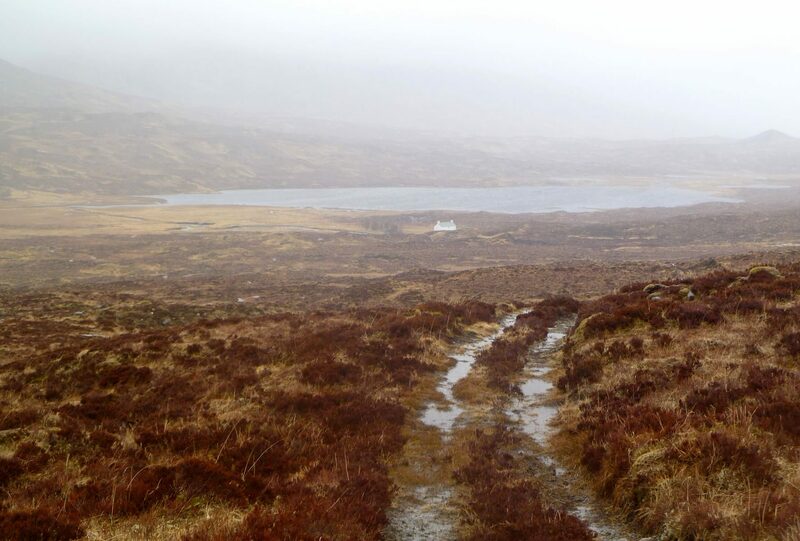 Footpaths were often flowing with water and it was often a bit drier to walk off the path in the boggy peat. Crossing streams and rivers will require wading, occasionally knee deep or more in fast current, and after a heavy rain some stream crossings will not be possible until water levels drop or you can find a localized safe place to cross. When the winds reach Beaufort 7 or 8 hiking becomes difficult to impossible, and even at relatively low CWT elevations we had a couple days with gale force winds. Beaufort 5-6 winds were common on our trip. 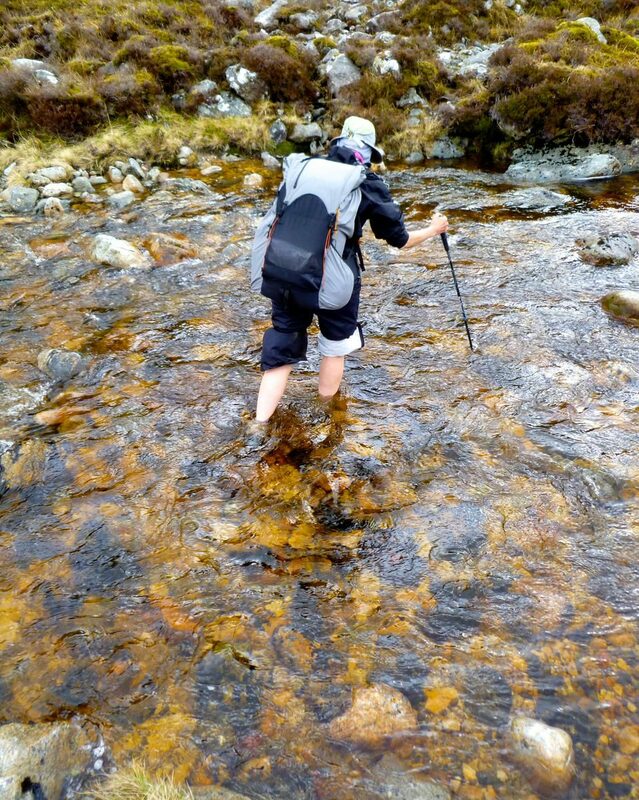 If bad weather and wet feet are not your thing, do not try the CWT. 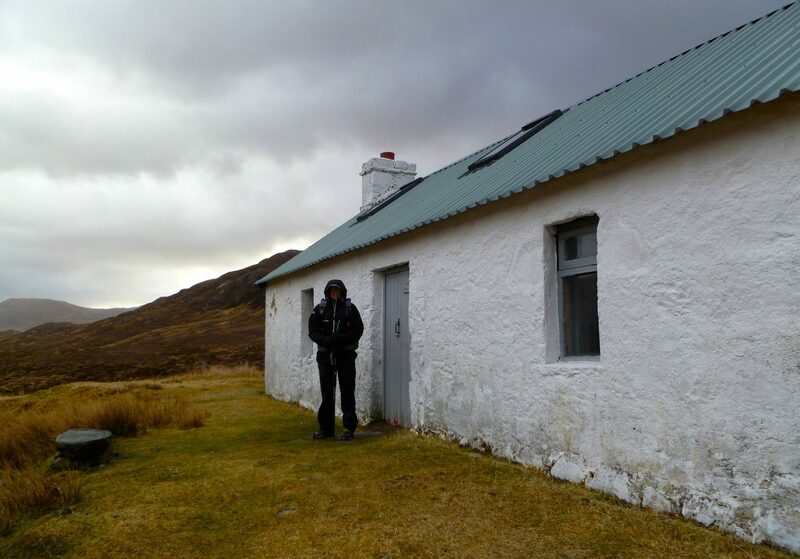 Keeping your spirits up and finding the mental fortitude to leave a warm and dry bothy and head out yet again into the cold and wet was, to us, the primary challenge of the CWT. When the weather turns really bad, keeping on the route and staying warm and dry could be a serious challenge to a hiker without the right skills and gear. The route is clearly more difficult than a National Trail or other popular way-marked and/or maintained trails. However, the route itself is not as technically or physically difficult as the HRP in the Pyrenees, the Cambrian Way in Wales, Roper’s Sierra High Route in California, or nearly any route in the canyons of the Colorado Plateau. There were almost no technical challenges other than steam crossings. Navigation was straightforward when the weather was fair. While crossing large expanses of trackless moor might be wet, we never found it difficult and thought most of the cross-country moor walking was fun. There are few aggressive or thorny plants other than easily avoidable gorse. We encountered few hidden boggy pits waiting to swallow hikers whole and found the dreaded tussocks to be much less tedious than expected. With the exception of the 609 meter Ben Dreavie, the CWT avoids the tops, so altitude gains and losses are mostly modest. 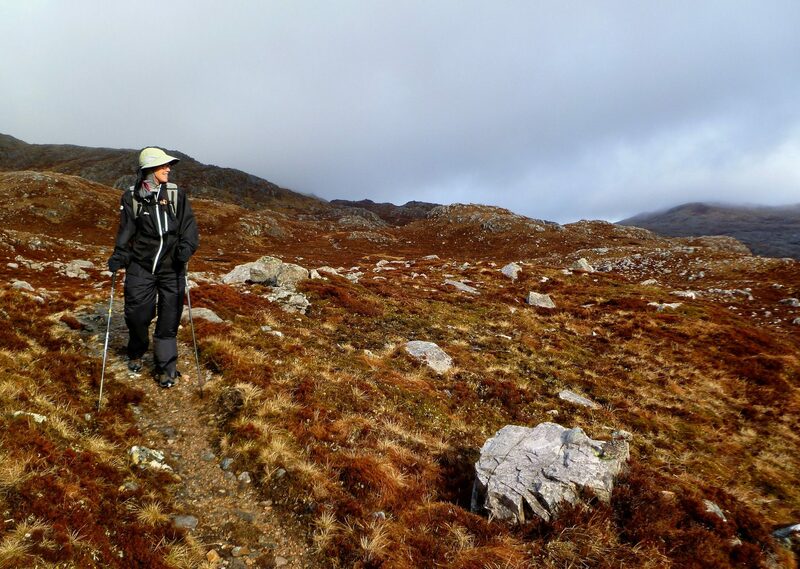 Given all of the above, we think any reasonably fit hiker with some off-trail hiking experience, decent navigation skills, good judgment, the gear and skills to cope with foul weather, and the right mental fortitude should be able to complete the CWT. We pieced together this route using two main sources. The first was David Cotton’s extremely detailed website about his 6,266 mile yearlong walk around the entire coastline of Great Britain. 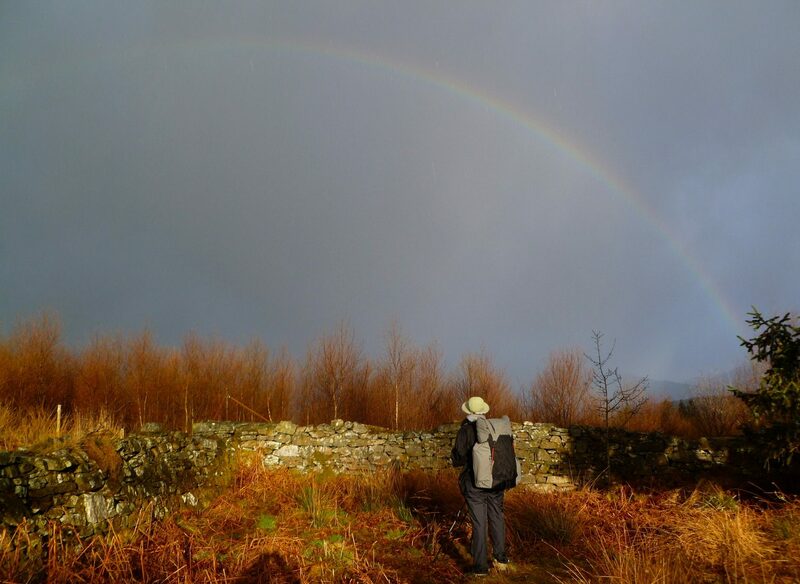 The author wrote very helpful day-by-day descriptions of his walk including route details and personal opinions about the quality of each section. After many hours studying satellite imagery we were able to modify his route to eliminate some road walking. We enjoyed this route quite a bit. There is some road walking, but traffic was extremely light and even the paved roads were often only one lane wide. We walked along miles of very fine coast, on par with other fine coastal walking we have done. 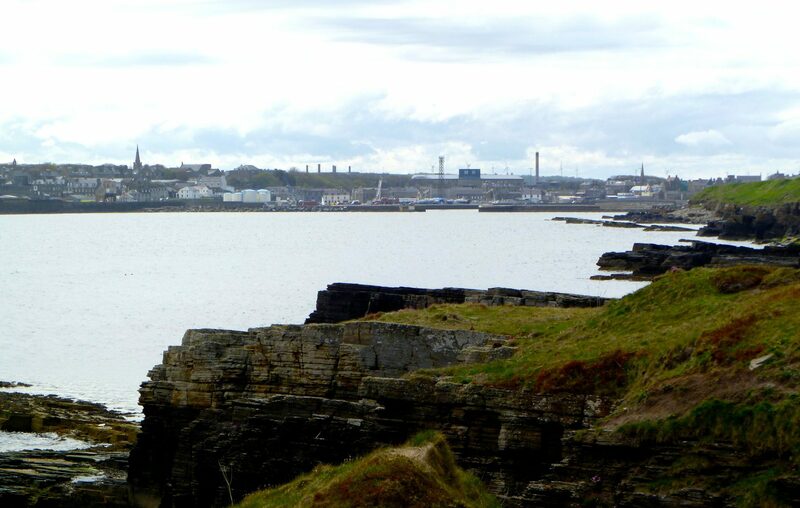 There is no established trail along most of the coast although local groups are creating a Scottish Coastal Path. In some stretches the farmers have built barbed wire fences right up to the edges of the cliffs, with no gates or stiles, so unlike the Southwest Coast Path, Pembrokeshire Coast Path, or Brittany Coast Path, this route includes a bit of hassle with fences. 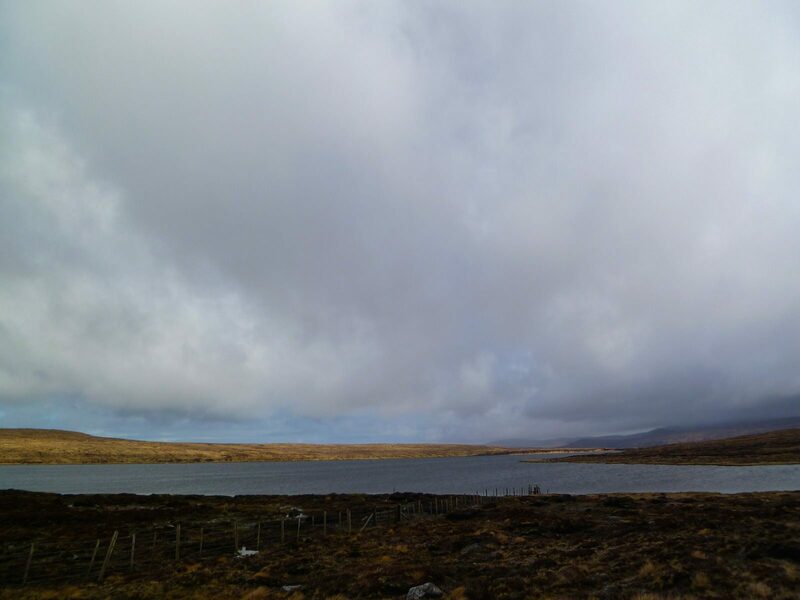 The north coast of Scotland records substantially less rain than the mountains traversed by the CWT and this matched our experience. We spent roughly 8 days on the NCW, and had relatively good weather on 4 of them. The total distance covered was about 175 miles. 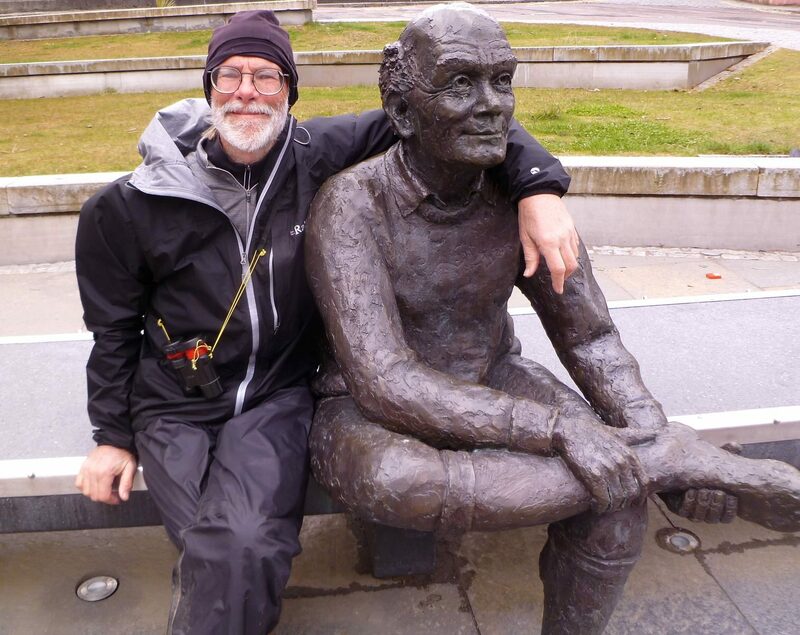 We started walking in Glasgow at midday on April 24 and completed in Wick in the afternoon on May 26; we were on our primary route for about 29.5 days (subtracting the time spent in the Orkneys). Statistically, Scotland generally has better weather in May than at other times of the year. 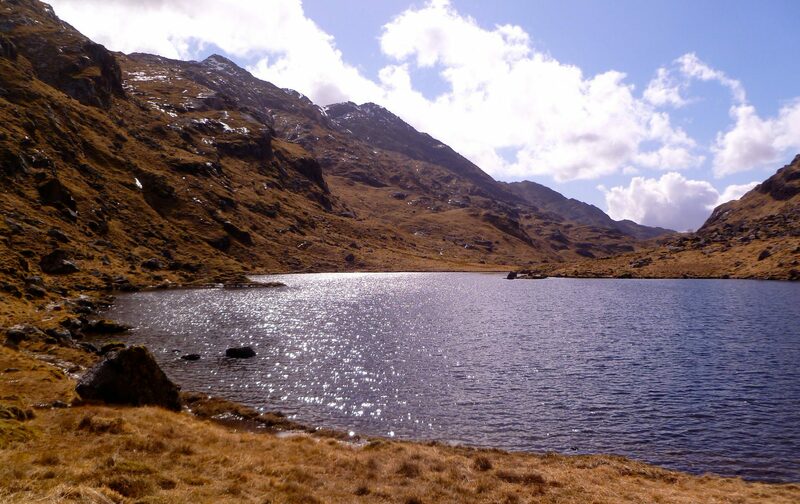 The snow has usually melted out of the higher mountains and daylight hours are long allowing lots of time to walk. And very importantly, the midges do not usually hatch until early June. Every source we have ever seen advised against hiking in Scotland during midge season; they will drive anyone insane. 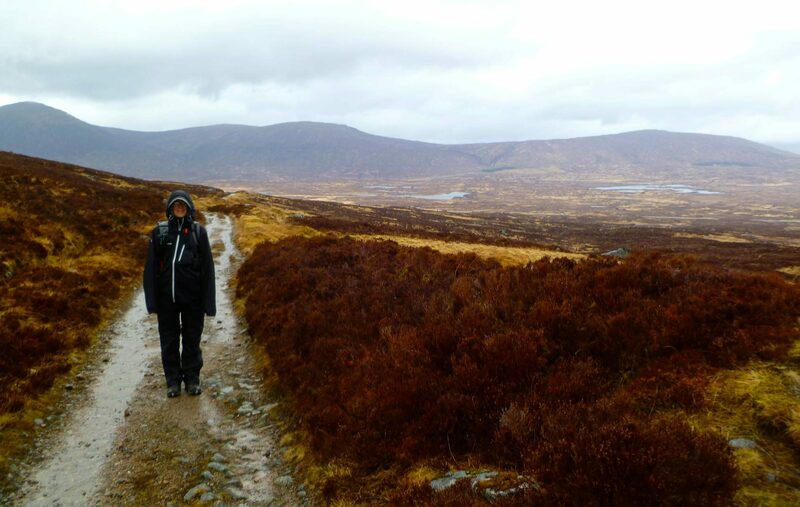 We had hoped that by doing the walk in May, we might have had some periods of good weather; this was mostly not to be. We experienced at least some precipitation on 25 of 32.5 walking days including 11 consecutive days with rain. 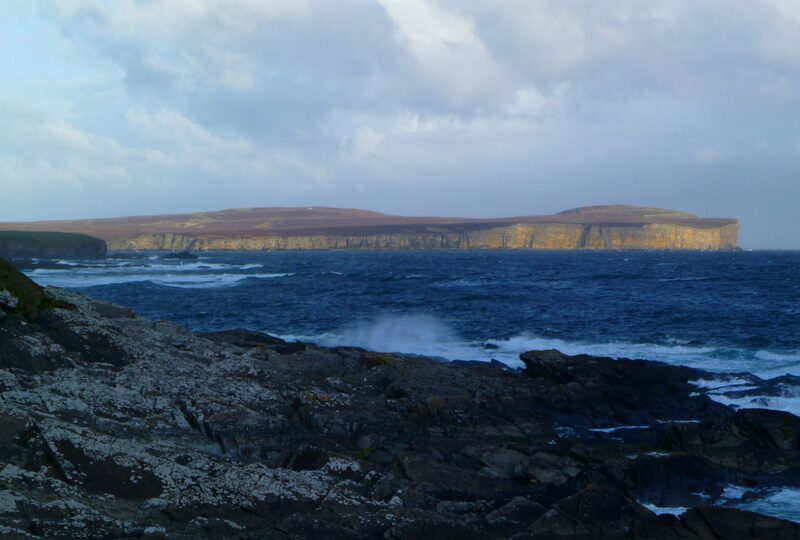 We had many days with very strong winds, including several days with gale force winds: the Orkneys recorded 55 mph gusts while we were walking there. It snowed on us at altitudes below 400 meters. We had long stretches where low clouds and mist obscured all views for many hours at a time. 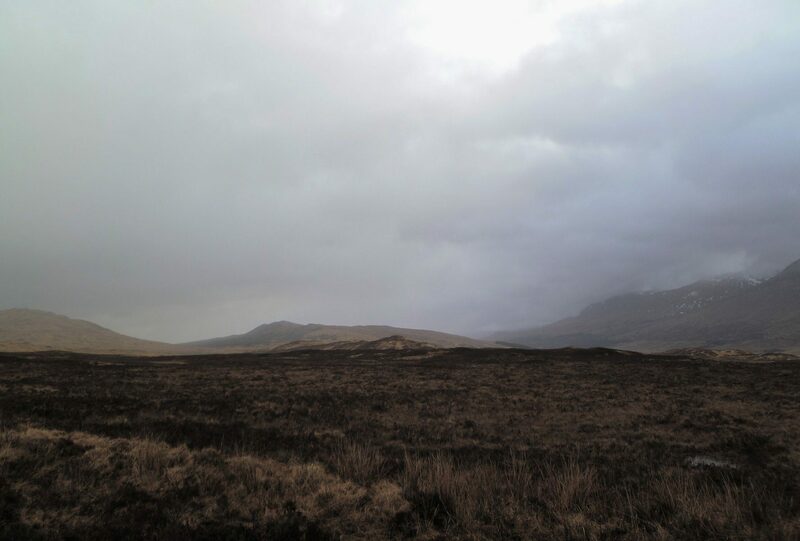 We experienced combinations of rain, snow, fog, and strong wind. Locals kept commenting that it was a very late spring and unseasonably cold and cloudy. In fact, for nearly our entire walk, the buds on the deciduous plans had not yet opened. Daytime temperatures were often in the 40’s, even at low altitudes. 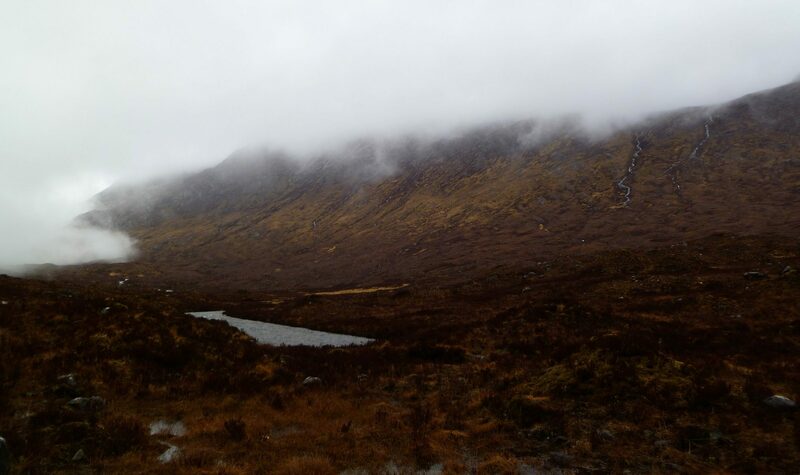 Our favorite weather forecast came from a Scottish hiker who told us “the weather is expected to be mixed”. 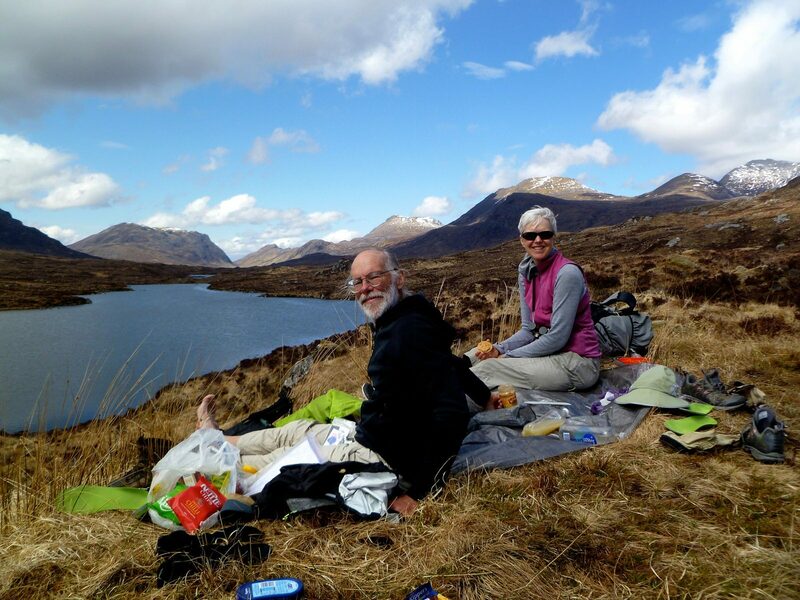 For another account of Scottish weather in May 2013, read our friend Manfred Kopisch’s excellent trip report about his experiences completing the TGO challenge: His west-to-east route crossed our south-to-north route near a pass just west of Sgorr Ruadh, a peak east of Torridon. Although we did have many cloudy days with reduced visibility and many hours of rain, we had no daytime heavy rain; usually the rainfall was drizzle or light, and for that we are grateful. There was only once when the wind was so strong that we were physically unable to proceed, and we were able to use a slightly lower nearby route that made it possible to continue. 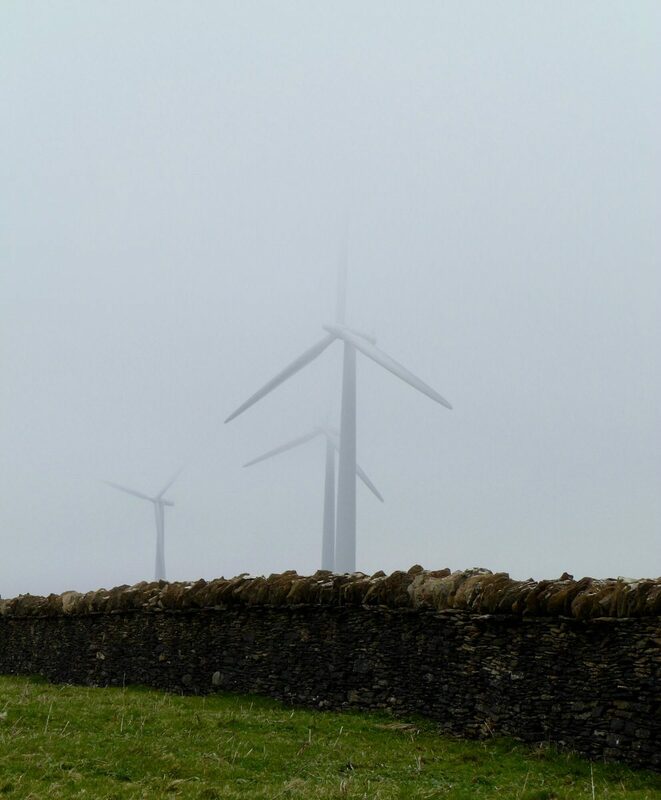 By Scottish standards, our weather could probably be called dreary, but certainly not as bad as it gets. 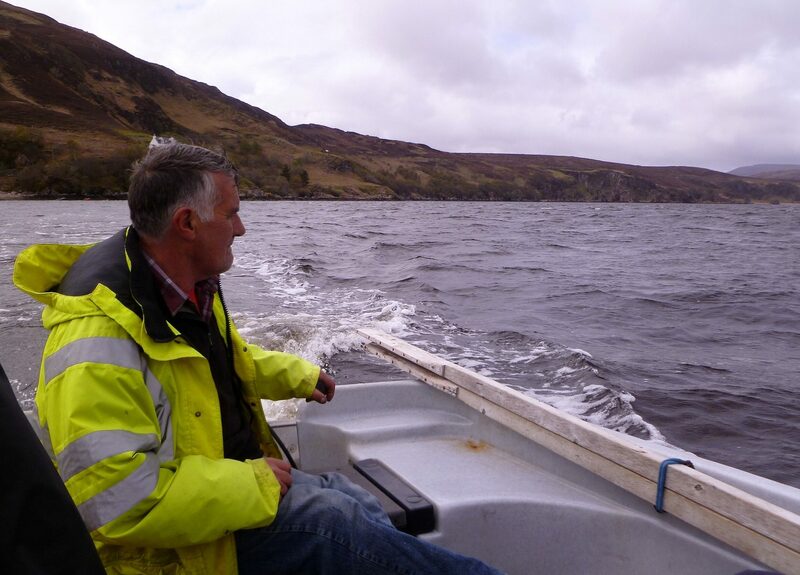 According to the Met Office Scotland received 139% of average rainfall during the month of May 2013. 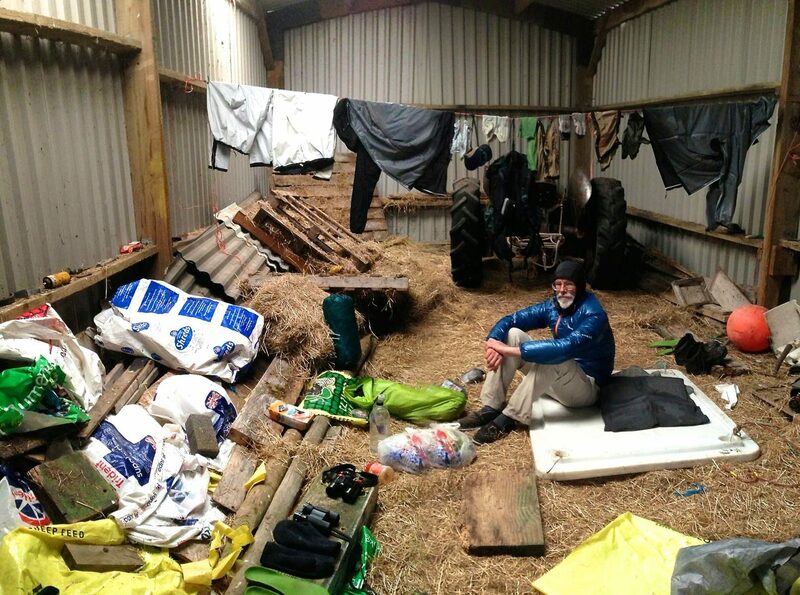 The wet weather made it quite difficult to find a comfortable place for lunch. We were warm while walking, but staying warm while sitting requires adding layers, which is a hassle when it’s windy and raining and there is no shelter, and we were not inclined to set up the tent mid-day in order to eat lunch. Even if we wanted to set up a tent or tarp mid-day, the ground was often so sodden that finding a dry place to sit was impossible. 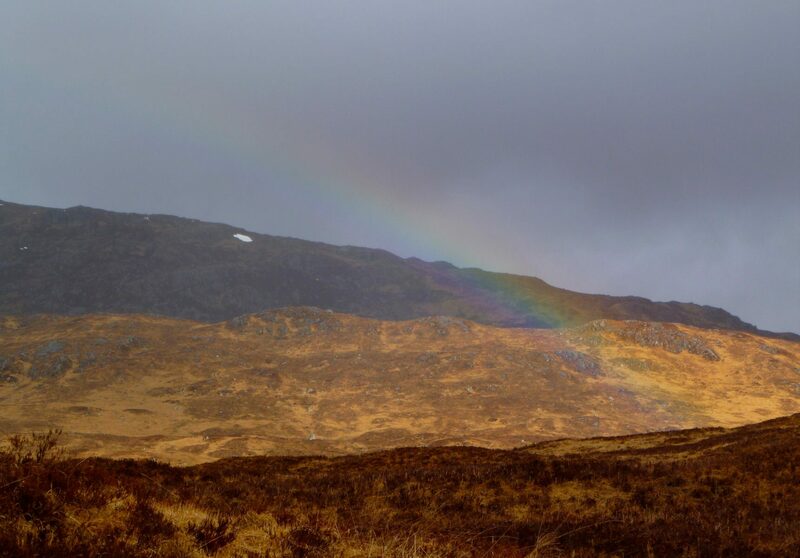 For these reasons we ate lunch in bothies or hotels numerous times; on rainy days we would leave the tent in the morning with a plan to hike straight through until the next known building where we would stop for lunch. With all the gusty, cool, and wet weather, just sitting back and relaxing and enjoying the scenery, as we like to do, was often impossible. We did not often take photos during rainy weather, so sunshine is disproportionately represented in our image gallery. For the most part, finding food was not a challenge. 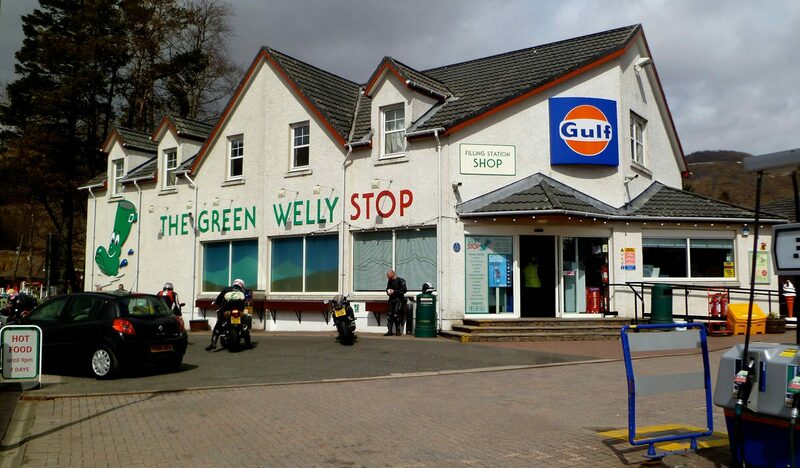 There are many places to eat or buy food along the WHW, and our best meal on this section was fine pizza at the Green Welly in Tyndrum. 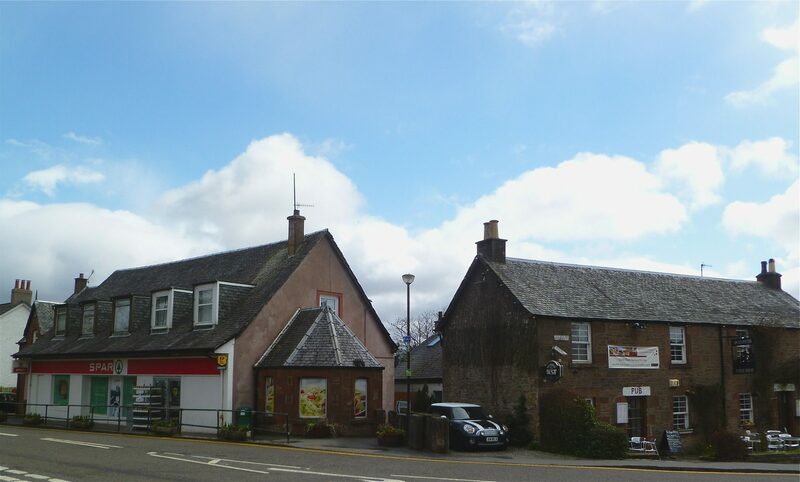 There are large grocery stores in Milngavie and Ft. William. Resupply on the CWT requires a bit of advance planning, as there are multi-day sections on the primary route where no food can be purchased. 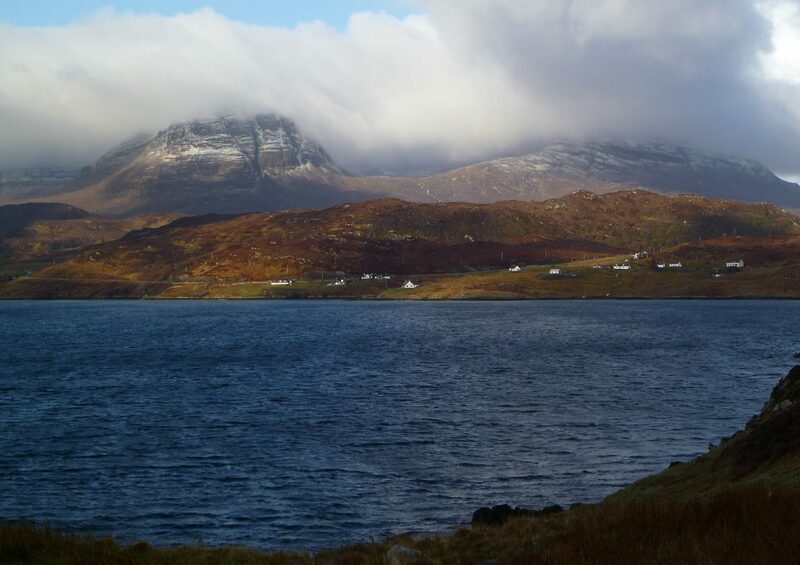 Grocery stores are found in Ft. William, Shiel Bridge, Kinlochewe, Ullapool, and Kinlochbervie. The stores in Shiel Bridge and Kinlochewe have a very limited selection and proprietors who did not behave as if they liked their customers. The SPAR market proprietor in Kinlochbervie, on the other hand, was extremely gracious and helpful, and we gorged on hot meat pies while doing our shopping. Buying meals along the way is possible in scattered locations from cafes, pubs, and hotels, although opening days and serving times vary a lot. 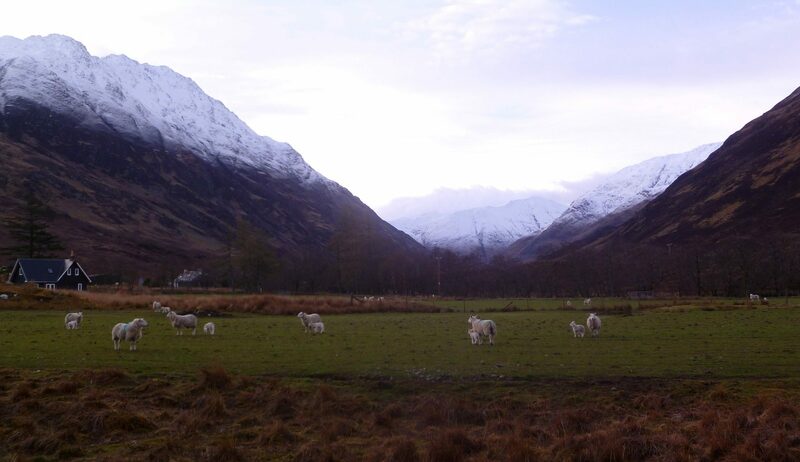 We had excellent meals at the Glenfinnan Hotel, in Kinlochewe at the Whistle Stop Café, and at the Oykel Bridge Hotel. Our other meals were adequate as fuel, but not memorable. On the NCW there were many stores, pubs, and restaurants along the way. Food costs were much higher in Scotland than the US and with the pound worth around $1.53 during our walk, things were only worse. A typical pub meal for two would be in the £20-30 range. We spent about $23 per person per day and ate about 20% of our meals in a pub or restaurant. We acquired the rest of our food at grocery stores. We camped most nights on this trip. On two occasions we set up inside of fishing huts, once in a barn, once on a bird watching platform, and once in the ruins of an ancient church. 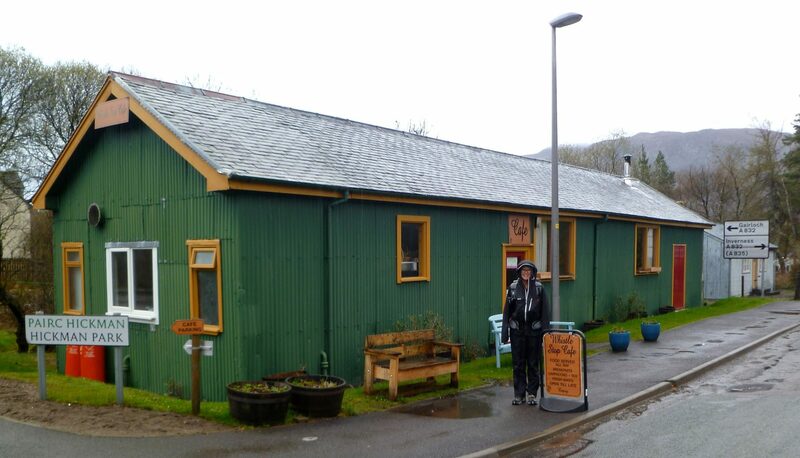 We also spent a night in a B&B in Kinloch Hourn, 2 nights in bothies, 2 nights camped just outside of bothies, and finally, in the Orkneys, inside a odd small public building at a beach, called the Waiting Room, where we had attached bathrooms with hot water and electricity. 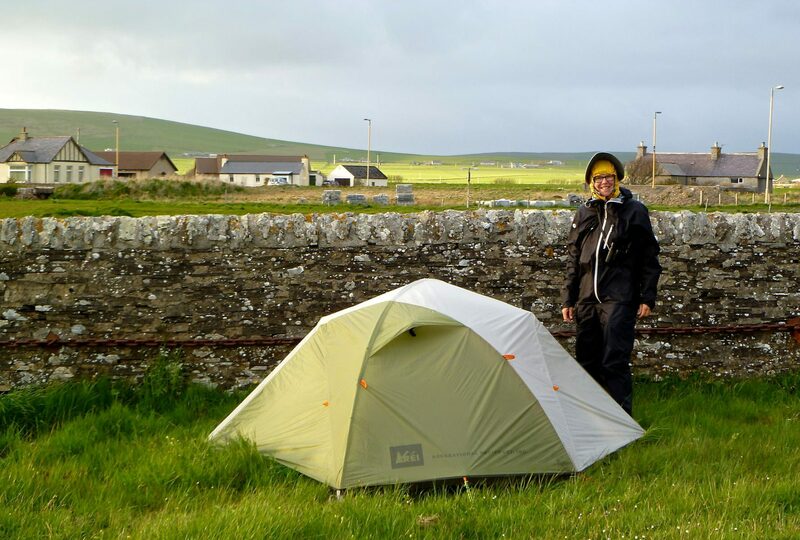 The Right to Roam laws in Scotland pretty much allow you camp anywhere you want as long as it is not in someone’s yard. 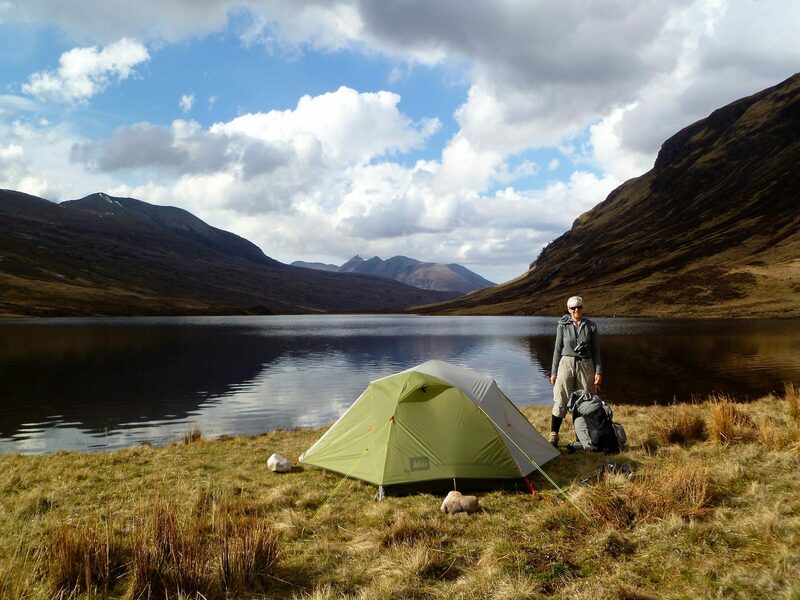 However, campsites in the mountains of Scotland can be difficult to find. Vast areas are undulating bogs with no really solid, flat, and dry surfaces. Stand on what seems to be a solid piece of ground for a few minutes and you slowly start to sink. If you find a dry place, it is often covered with tussocks or other large lumpy plants. There is rarely shelter from the wind as there are no trees outside of the forest plantations, and these are generally not usable as campsites as the ground had been bulldozed into irregular rows prior to planting. 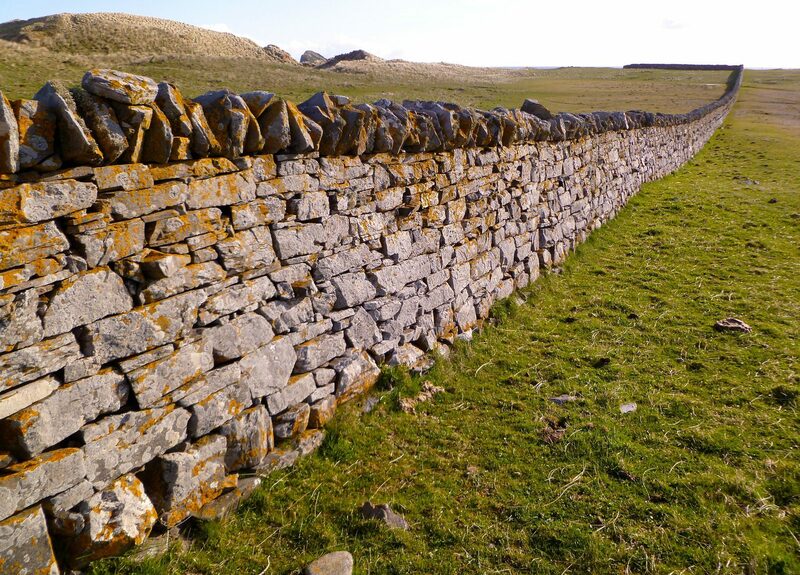 When available, sheep pastures with stone walls around them provided good campsites. 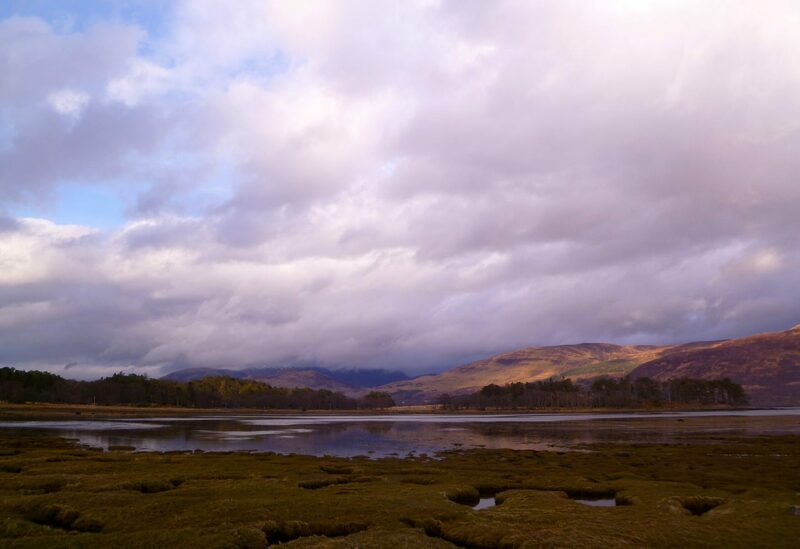 Sometimes there are beaches at the edges of lochs, but don’t count on this. 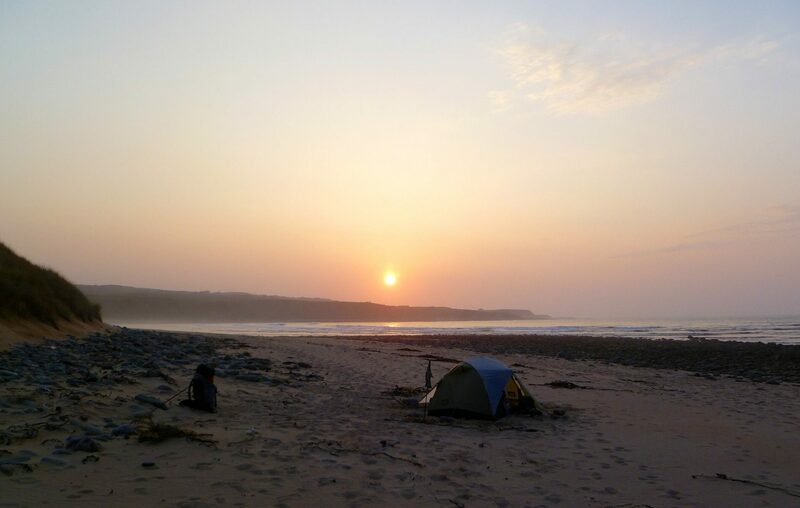 If you do camp next to a beach or along a river, note that the west coast of Scotland has huge tidal swings and river banks can flood miles inland from the sea. We learned that the hard way. 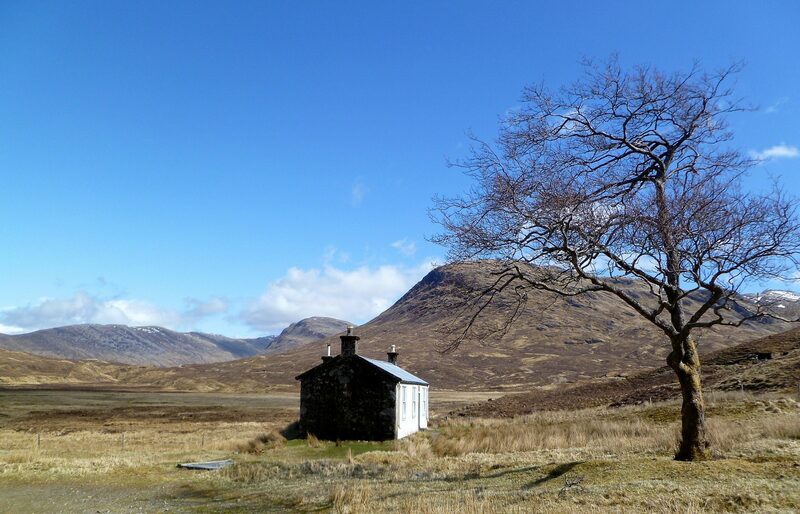 Usually there are a few flat places near the bothies that can be used for a tent if you prefer private sleeping quarters over sharing the bothy with other hikers. We were always able to come up with something that was at least acceptable, but it required forward planning each day and sometimes stopping earlier or later than we might have liked. 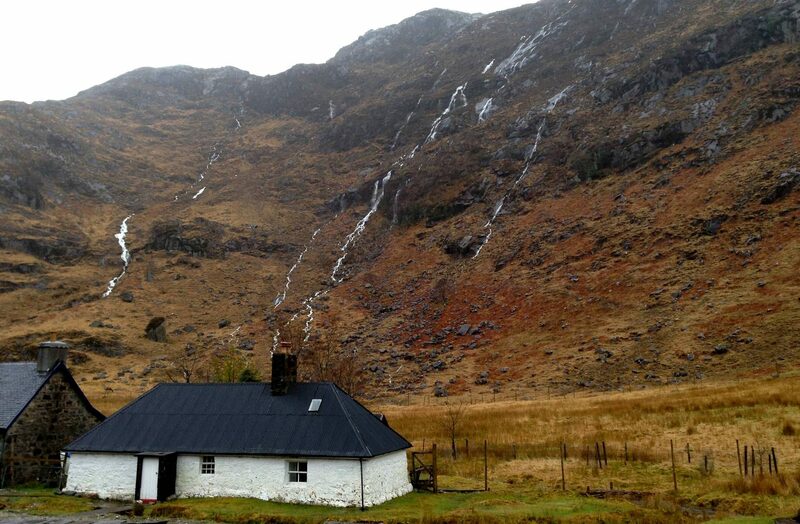 A bothy is a small unstaffed shelter widely found in the Scottish mountains. 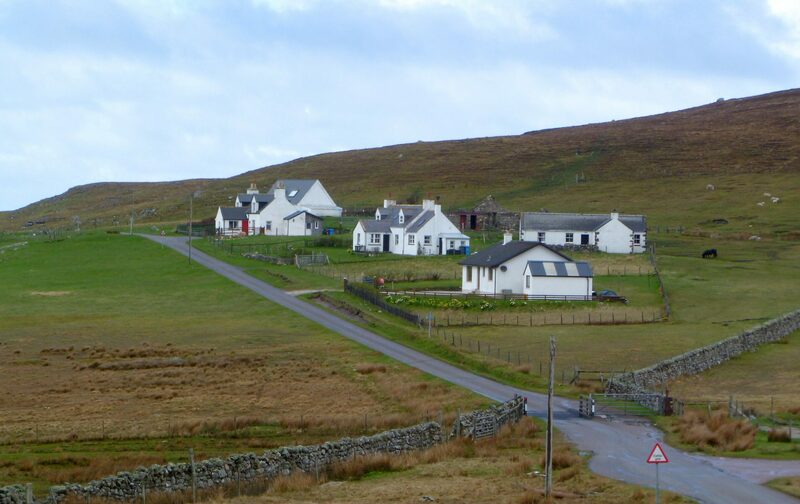 These buildings are often old farmhouses or shepherds’ cottages and are open for free public use. 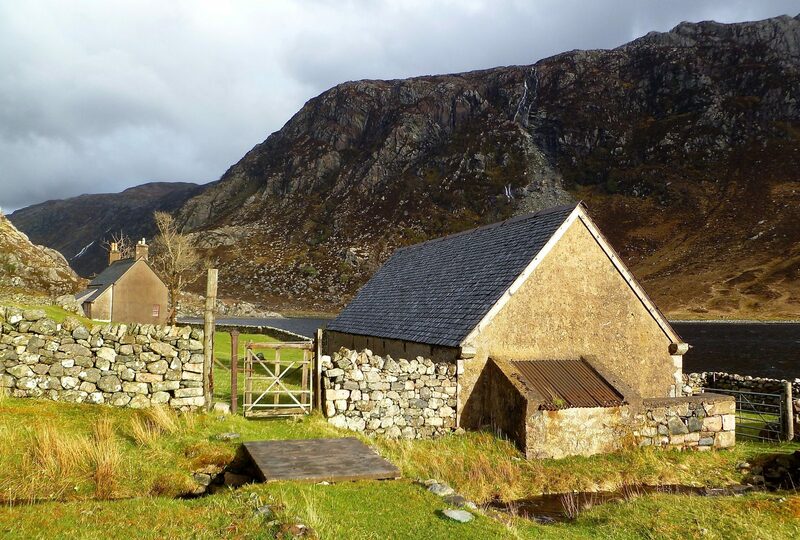 There is a long tradition in Scotland of using bothies as both emergency refuges and planned places to stay on a backcountry trip. They usually have a fireplace or two, although fuel may not be always available. Most were reasonably tidy considering that they are open to the public. In practice, these buildings were incredibly useful for getting out of the bad weather. 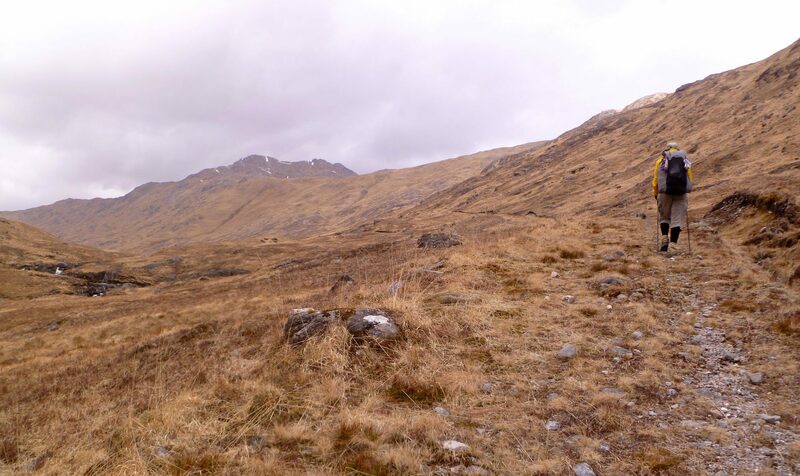 Given that we were in Scotland during a prime hiking season, we saw surprisingly few long-distance walkers. We saw lots of day hikers and a few thru-hikers on the WHW; many of the thru-hikers use baggage transport services and stay in B&Bs, so they just carried day-packs. On the CWT, we ran into less than a dozen backpackers. We did not meet another person thru-hiking the CWT until after we finished our walk, when we met an Englishman in a pub in Durness who had completed a few hours after we did. 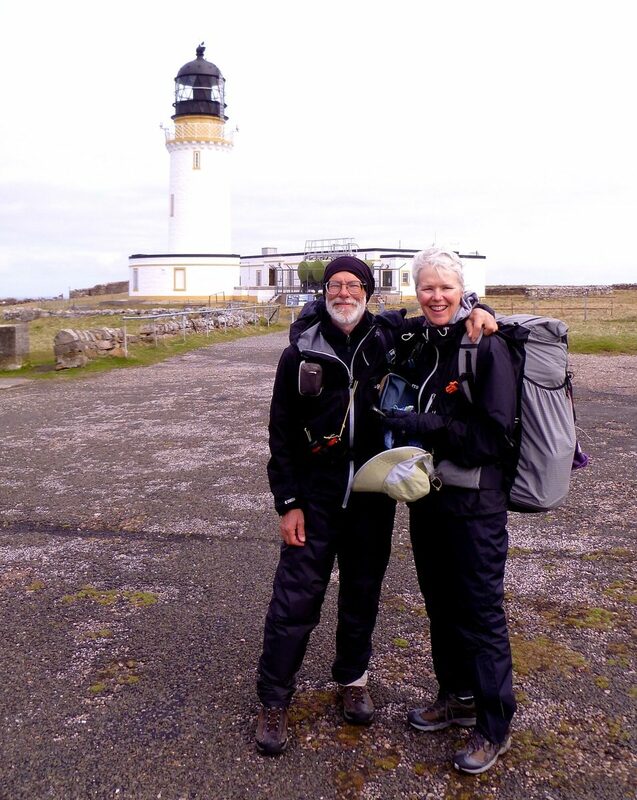 The proprietor at the Ozone Café at the Cape Wrath lighthouse told us that about forty people had finished before us in 2013, but he wasn’t specific as to how many of those had hiked the entire route. None of the hikers we met were using light-weight backpacking techniques and many of them were carrying truly monstrous loads. We watch birds on our walks and Scotland did not disappoint. We added four species to our life-list: Arctic Loon, Great Skua, Black Guillemot, and Common Scoter. Given that we have spent a lot of time birding in the England and Wales, we were quite pleased to see these new birds. Overall, we observed around 120 species. Pipits were by far the most numerous passerines. We saw few raptors. The bird of the trip was the Eurasian Oystercatcher; this bold, lively and strikingly marked shorebird was seen everywhere, surprisingly even deep in the mountains, in woodlands, and over the inland moors. The raucous beep beep call as pairs careened about always helped to cheer us up, even in the worst weather. 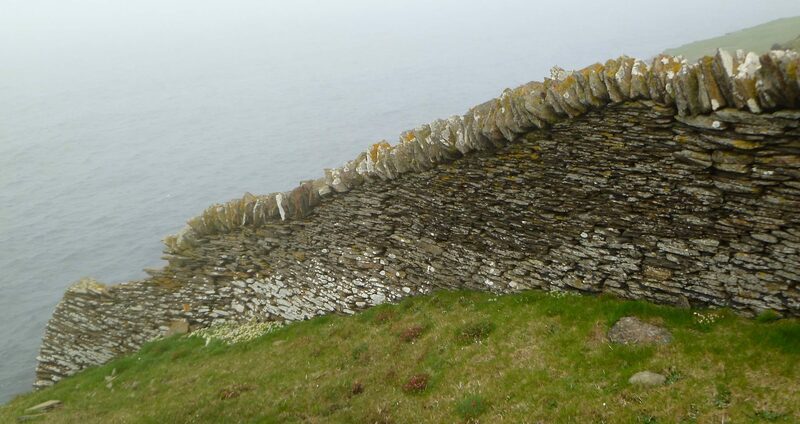 The other standout species was the Northern Fulmar, which is found in large numbers in colonies along the north coast cliffs and on the Orkneys. This dignified bird is a magnificent practitioner of the art of updraft aerobatics. 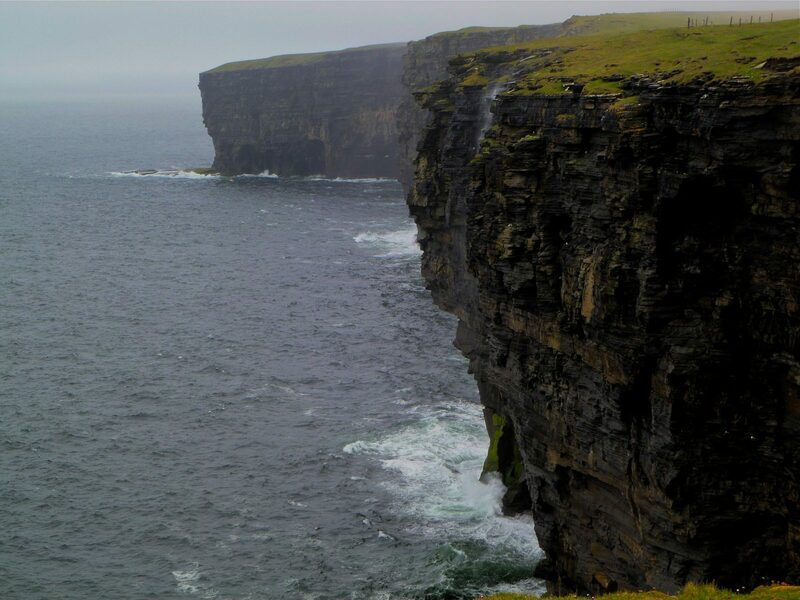 Watching the birds as they maneuvered only inches from the cliff faces in high erratic winds was fascinating. It looked like a lot of this activity was done for the sheer joy of flight. 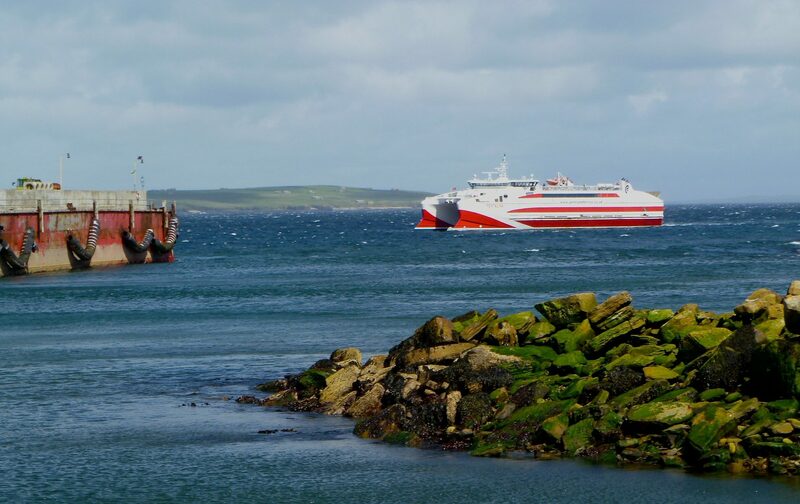 When we reached Gills Bay, we had a couple spare days, so we decided to use the extra time to take the Pentland Ferry to St. Margaret’s Hope in the Orkney Islands. 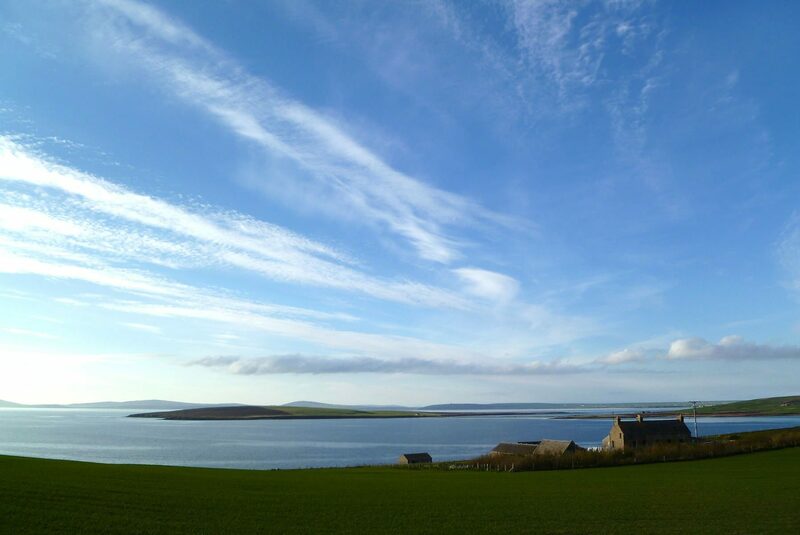 The Orkneys are a group of about 70 islands and islets (skerries). 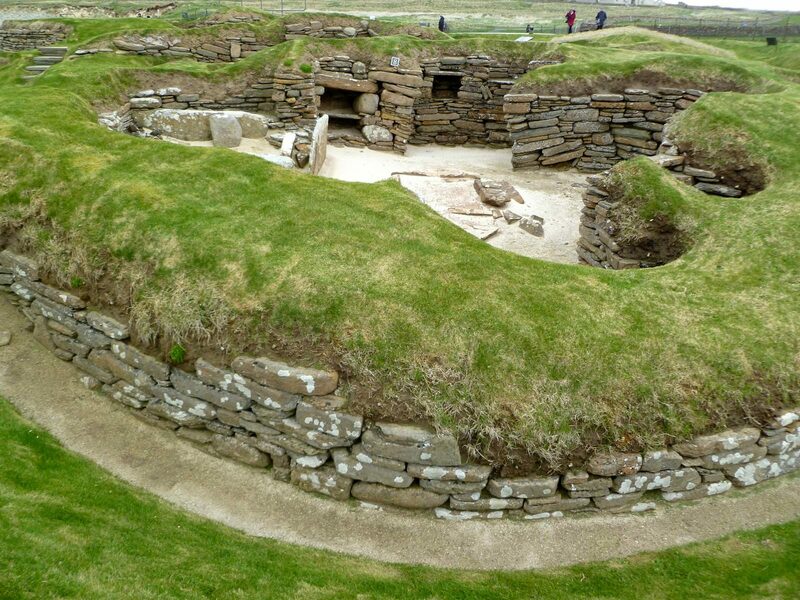 While there, we enjoyed visiting 4000 year old stone circles and the remains of a Neolithic village at Scara Brae. We also walked across some interesting upland moors which support breeding populations of a few bird species which are difficult to find in other places in Britain, including Short-eared Owl and Pomarine Jaeger. The people were very friendly, the pace of life seemed quite relaxed, and although stark, the islands were strangely beautiful. The weather was again mixed with rain the first afternoon, gale force winds all the next day, and low clouds transitioning into a gorgeous sunny afternoon on our last full day. Our early morning ferry ride back to the mainland was on glassy seas. Food is available from cafes, restaurants, and shops in most small villages and all towns. Finding campsites was not difficult.